1994 Where Should Aluminium Go? 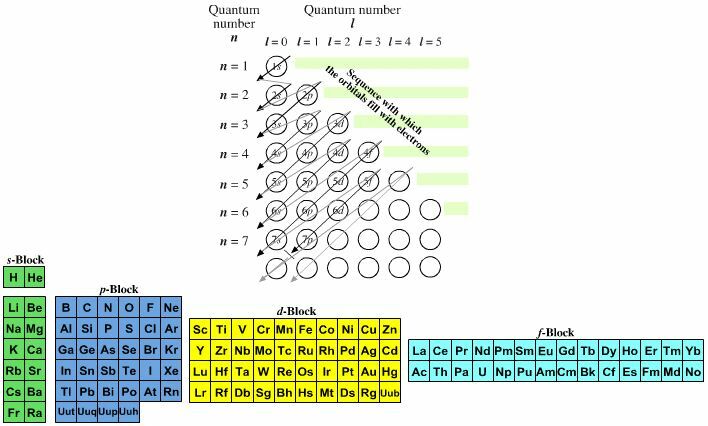 The modern periodic table is based on quantum numbers and blocks, here. 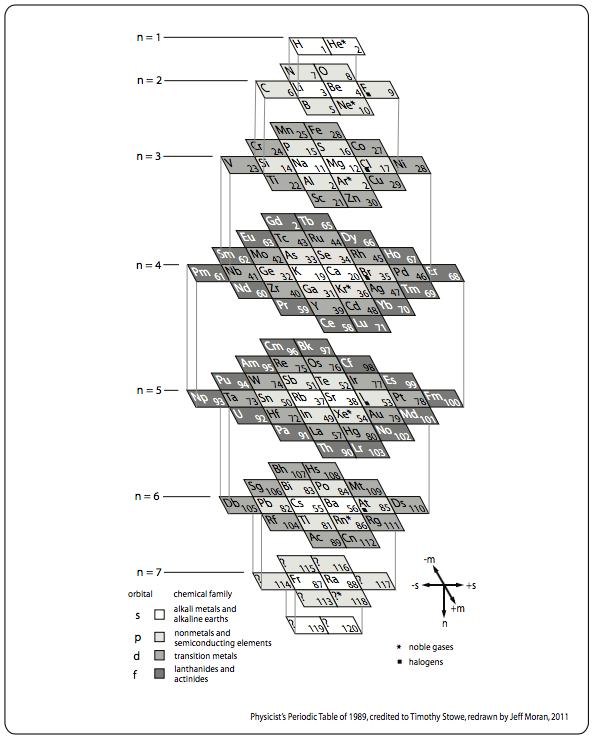 The problem with this mapping is that the generated sequence is not continuous with respect to atomic number atomic number, Z: Check out the sequence Ar to K, 18 to 19. 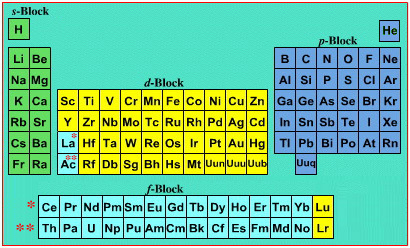 While the Janet periodic table is very logical and clear it does not separate metals from non-metals as well as the Mendeleev version, and helium is a problem chemically. 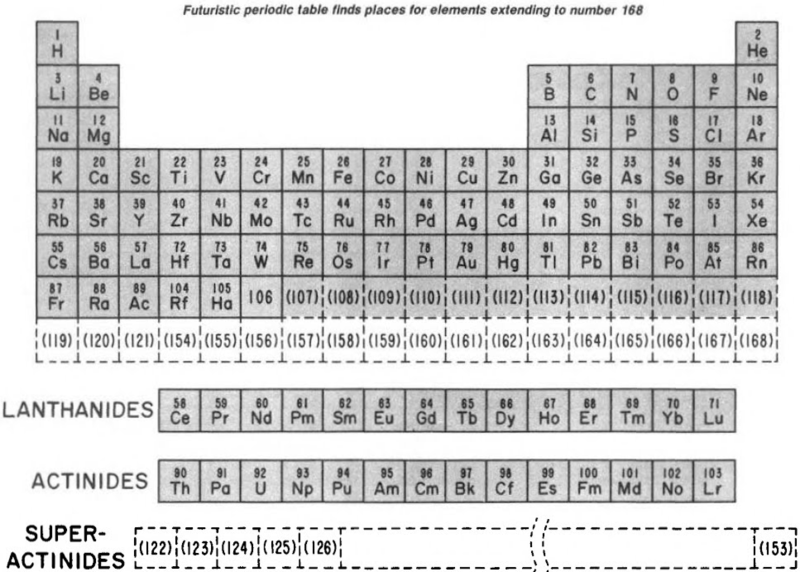 On this page web, "full" f-block included periodic tables are shown wherever possible, as above. However, the compression used introduces the well known problem known as a "fence post error". Chemically, the elements can be fitted in and classified either way. Many thanks to JD for pointing the situation with the periodic table is a fence post error. 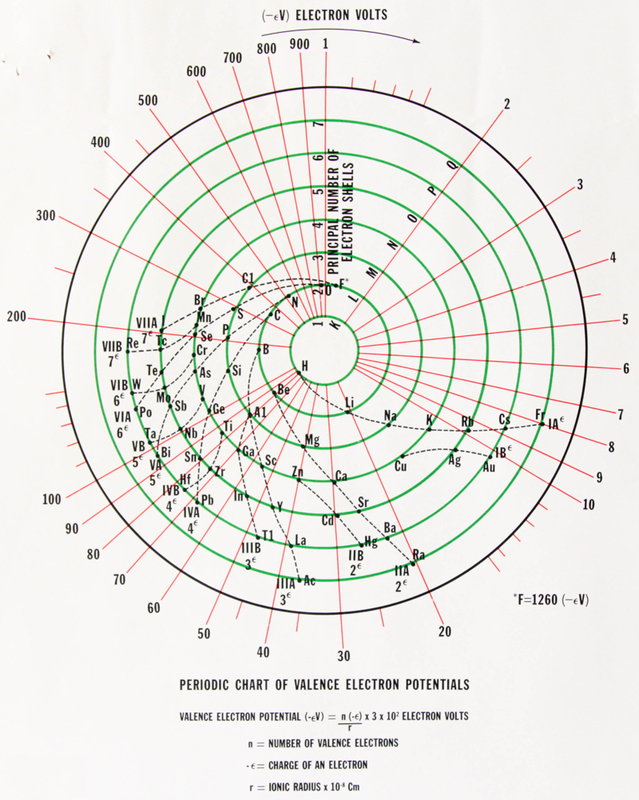 John D Clark's 1950 chart. It looks as though the experience of producing the 1949 version for Life Magazine caused him to have a radical rethink. John D. Clark, A modern periodic chart of chemical elements. Science,111, 661-663 (1950). Information supplied by Philip Stewart. Californium, atomic number 98, has a mass of 251 au. 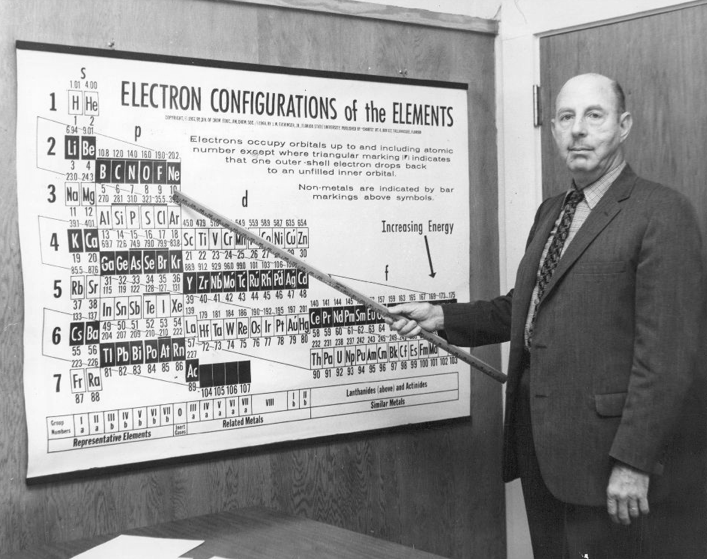 Californium was first observed in 1950 by S. G. Thompson, K. Street, Jr., A. Ghiorso and G. T. Seaborg. 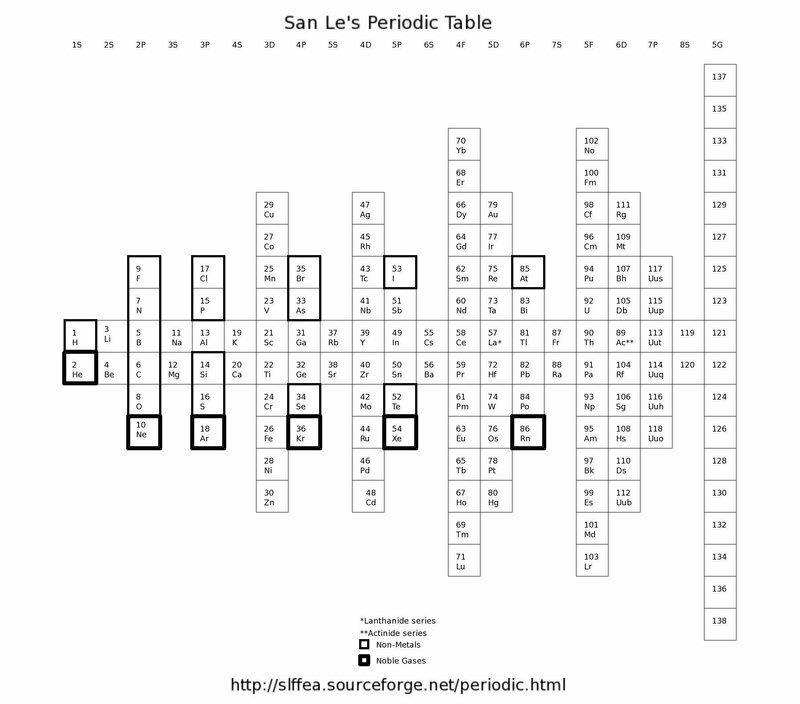 Periodic Table of Elements - Ca. 1950's - The ninety-two elements are here arrayed in colorful and orderly fashion. 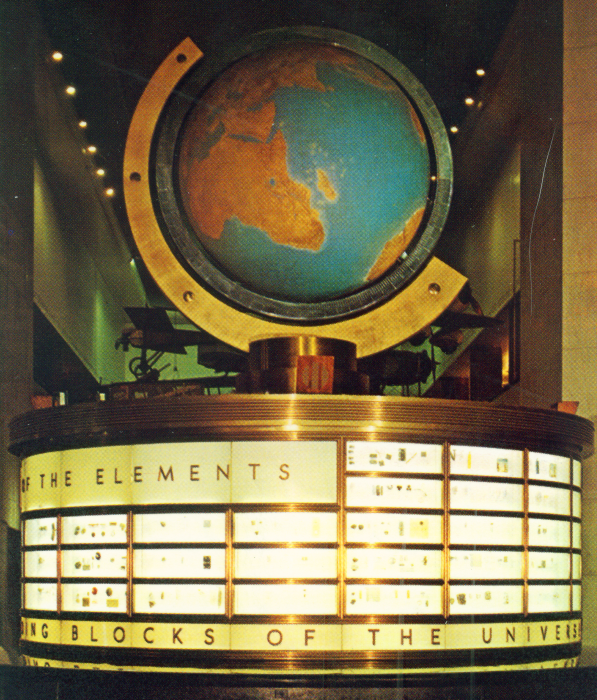 These "building blocks of the universe" stand beneath the great central dome of the Museum. 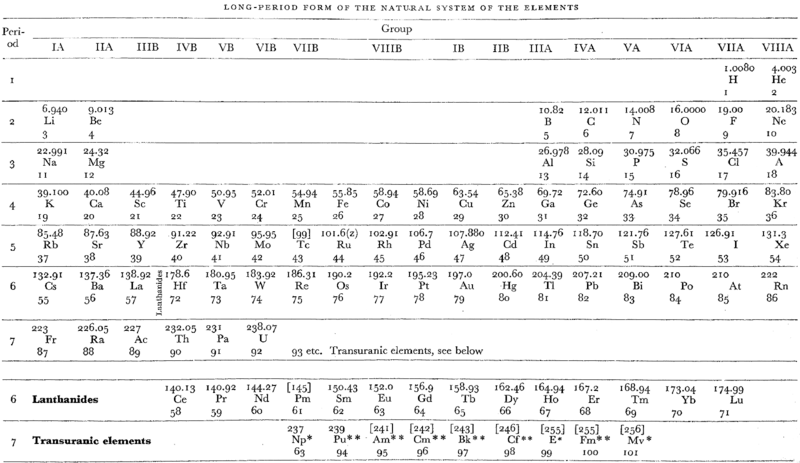 Mellor's periodic series of the elements lists the rare earths as a vertical column below Y in Group III. 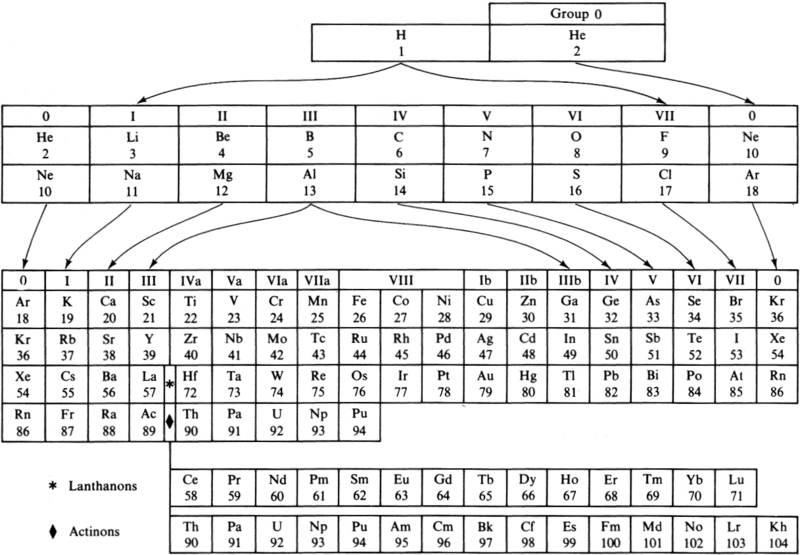 Element Z=61, is identified as Il, illinium. The peculiarities of Ce, Eu, Tb and Yb are not evident. U is positioned below W emphasizing its 6+ oxidation state. 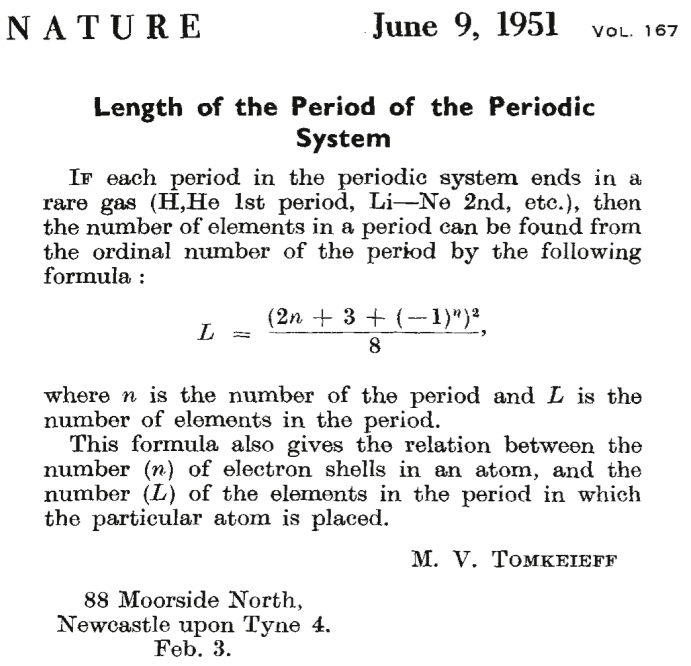 Reino Hakala published a paper, The Periodic Law in Mathematical Form, J.Phys.Chem., 1952, 56(2) 178-181. It is argued that: "Janet's [left-step] best meets these requirements". Einsteinium, atomic number 99, has a mass of 252 au. Einsteinium was first observed in 1952 by A. Ghiorso et al. Fermium, atomic number 100, has a mass of 257 au. Fermium was first observed in 1952 by A. Ghiorso et al. Spanish to English translation from here. 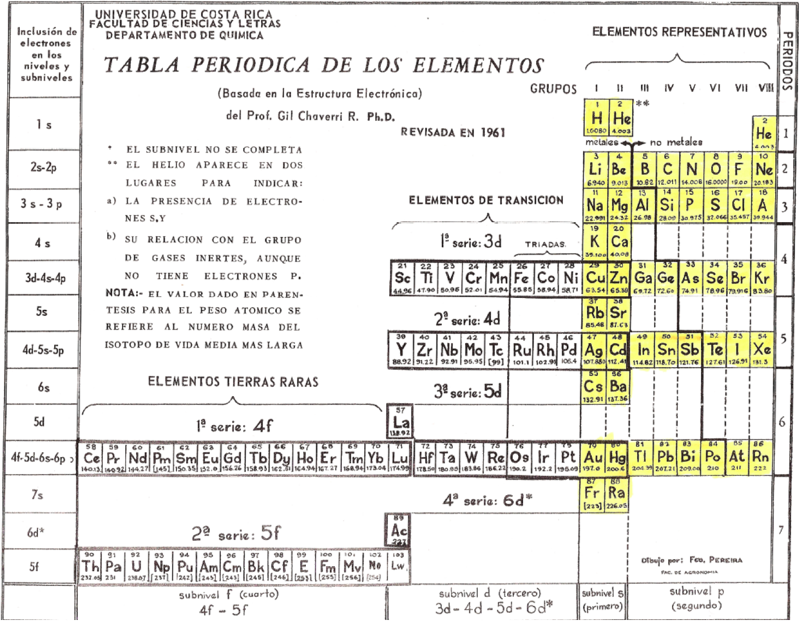 "The arrangement of the Periodic Table of the Elements according to Gil Chaverri-Rodríguez mainly takes into account the electronic structure of an element in determining the element's position in the table. 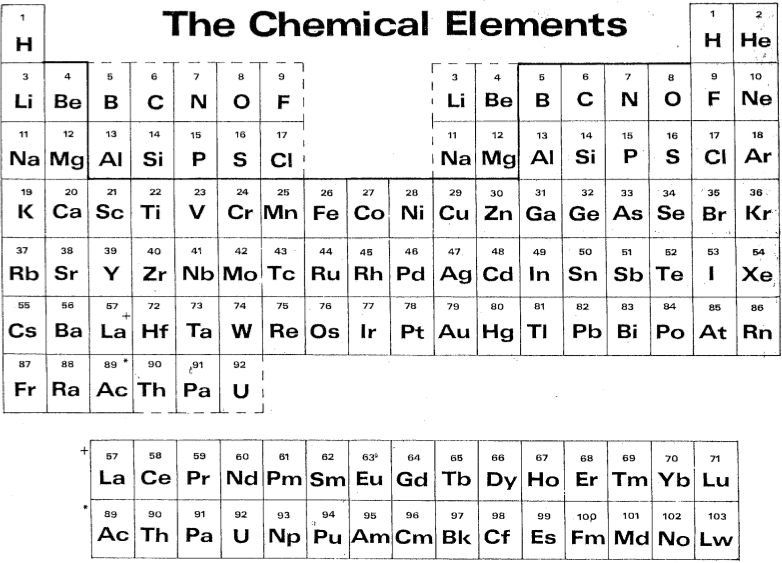 It takes into account the different periods of elements have different length, because the first is of two elements, then followed by two periods of eight elements each, then two periods of 18 elements each, then a period of thirty-two elements and finally a seventh period incomplete. 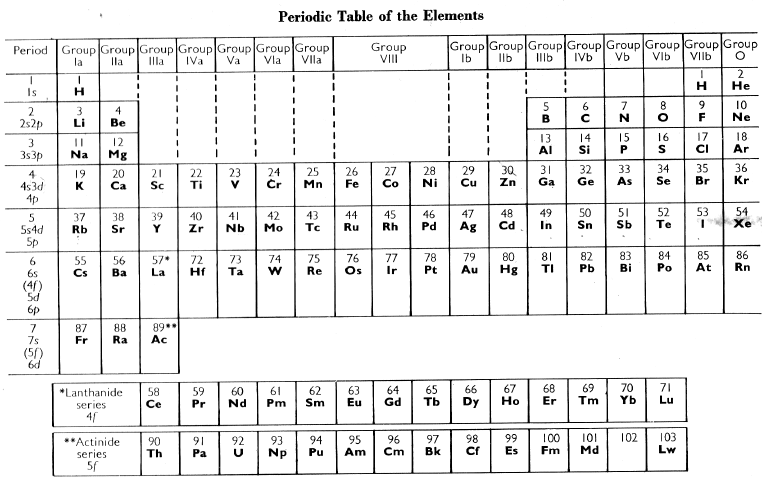 "The table takes into account the important fact that, despite the variable length, the first two elements and the last six items in each period respectively have similar properties, forming the eight groups or columns of representative elements with similar chemical properties. The elements that constitute the Series Transition and Rare Earth Series are arranged in rows, in locations that correspond to how energy sublevels are filled that characterize these elements. Each element corresponds to a specific place and only in a box in the table, with no need to drop items off the table, at the foot of it, as in previous arrangements. 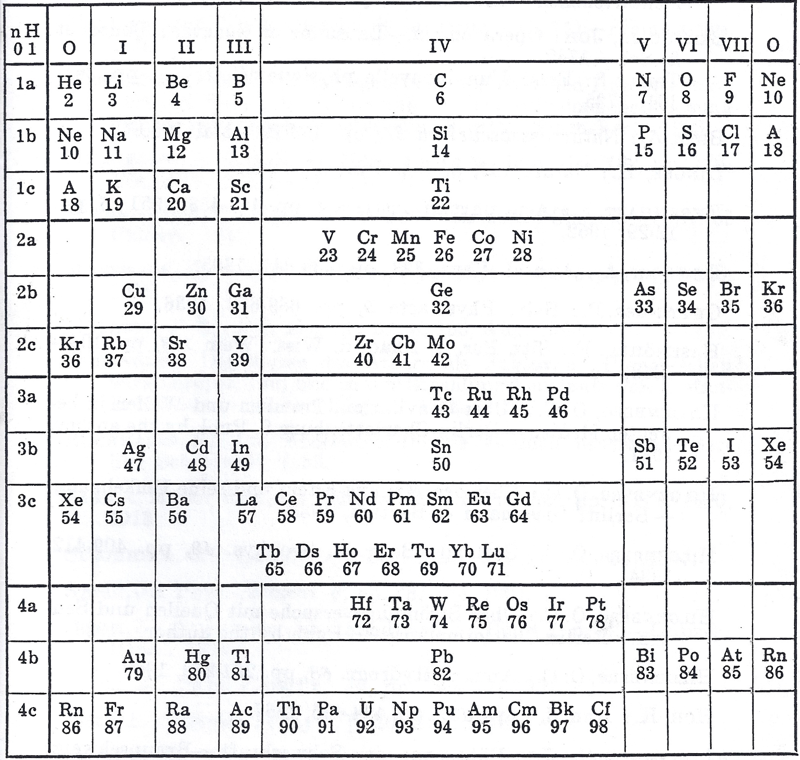 From the Russian Book: 100 Years of Periodic Law of Chemical Elements, Nauka 1969, p.87. 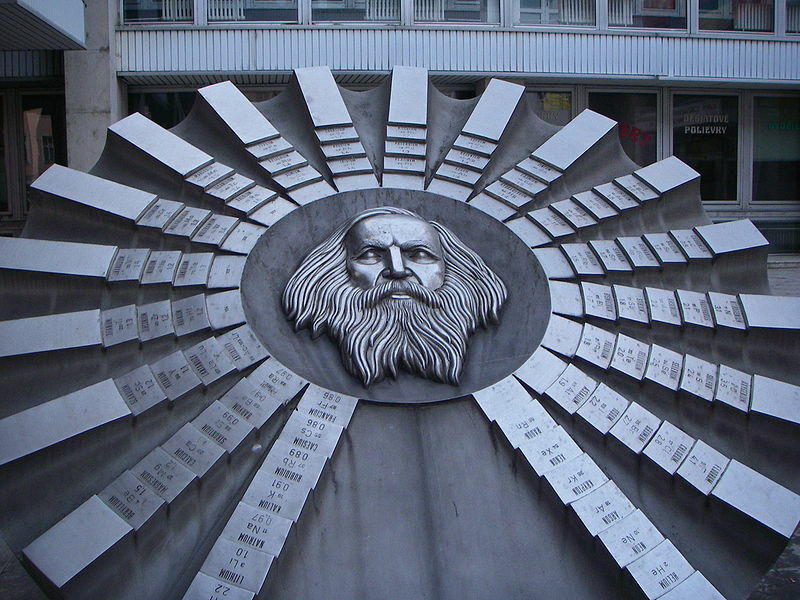 The caption says: "Volumetric Model of 18-period Long System of D.I.Mendeleev." 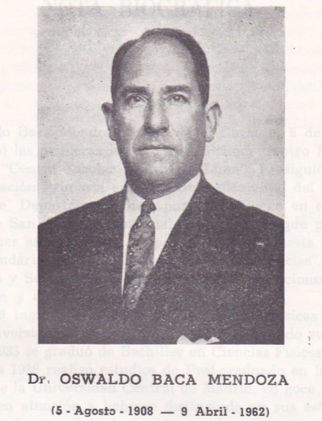 after Sabo and Lakatosh (1954). Thanks to Larry T for the tip! Thanks to Edmond Maurice Peyroux for the tip! Thanks to Philip Stewart for the tip! Mendelevium, atomic number 101, has a mass of 258 au. Mendelevium was first observed in 1955 by A. Ghiorso, G. Harvey, R. Choppin, S. G. Thompson and G. T. Seaborg. 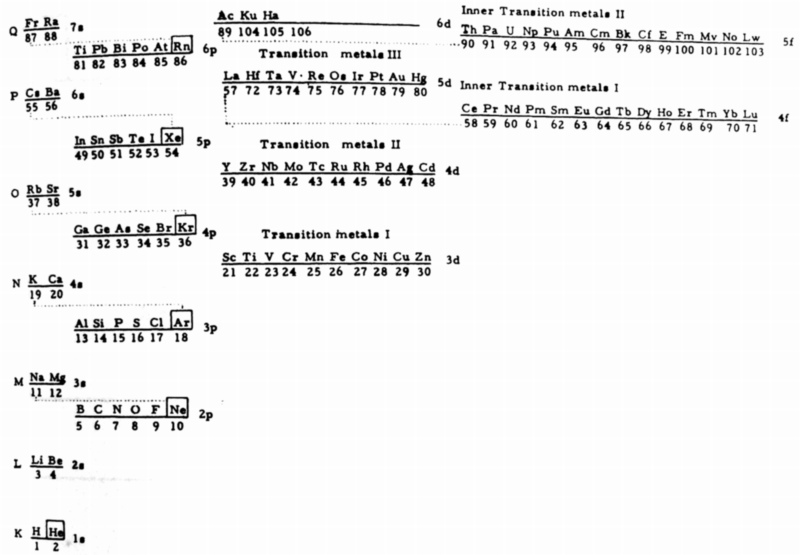 From H. Remy's 1956, Treatise on Inorganic Chemistry, Vol. 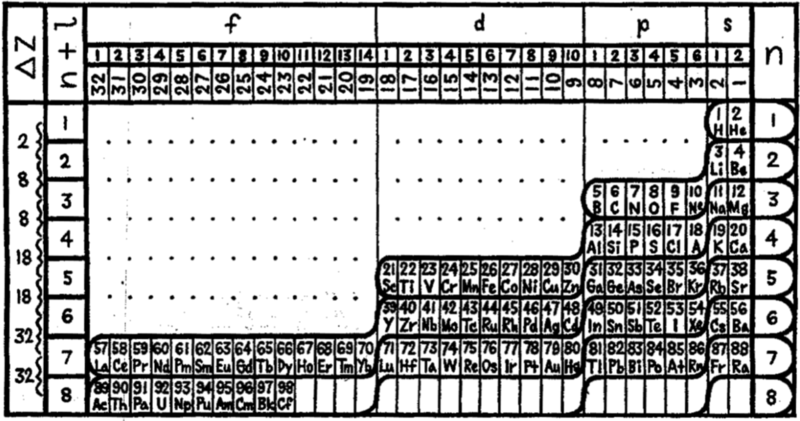 1, (Introduction and main groups of the periodic table), Elsevier, Amsterdam, p. 4, is what Remy calls a "Long-Period Form of the Natural System of the Elements". 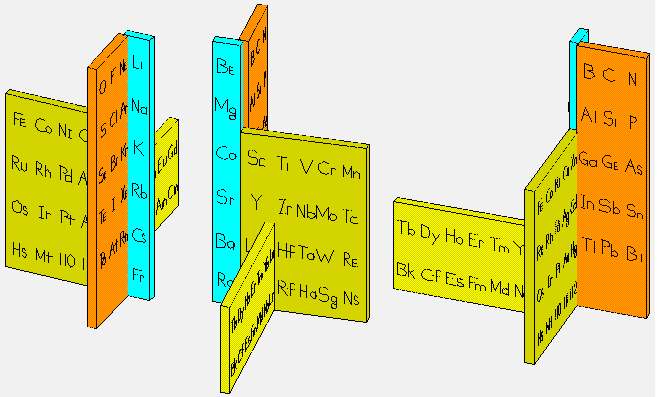 This is a semi-lanthanide/actinide formulation, with Th-Pa-U shown as 6d metals, and the remaining actinides (Np, etc.) shown as transuranic counterparts to Pm, etc. 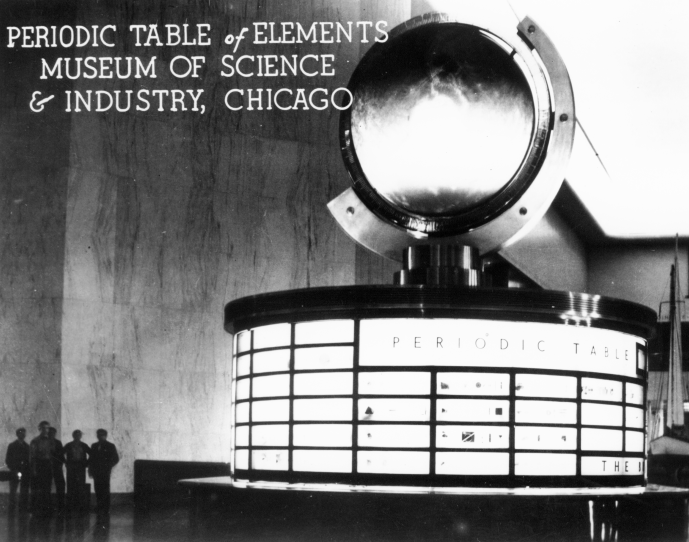 The layout of Remy's table was based on ideas by Haissinsky in competition with Seaborg's formulation of 1945. 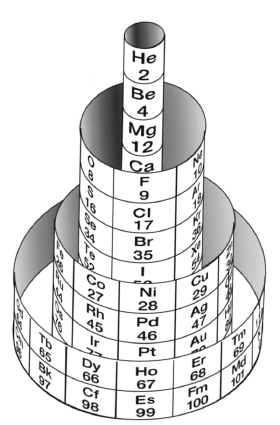 Spiral Periodic Table by Theodor Benfey, click here for a live web version. 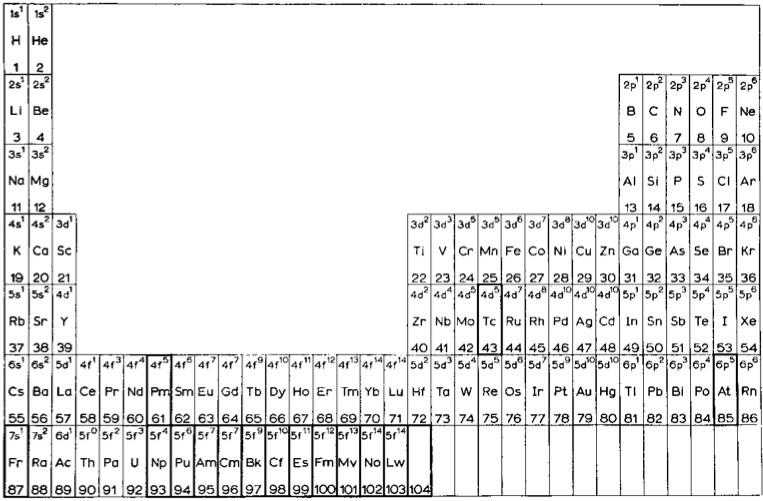 From The Nature of The Chemical Bond, 3rd Ed, pp 93, Pauling gives a periodic table showing the electronegativity of the elements. 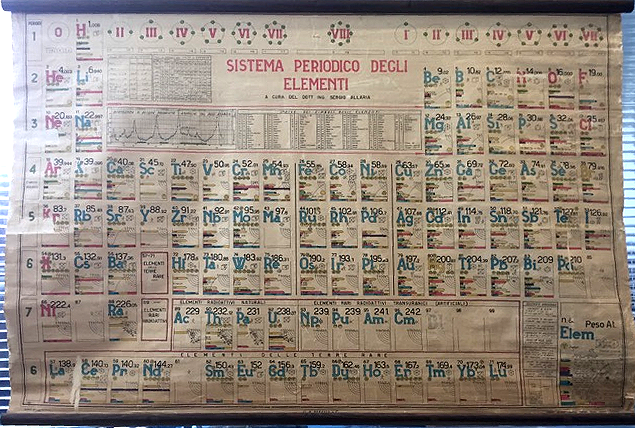 An Italian Periodic Table in Science Museum, Turin (Estimated date 1960). 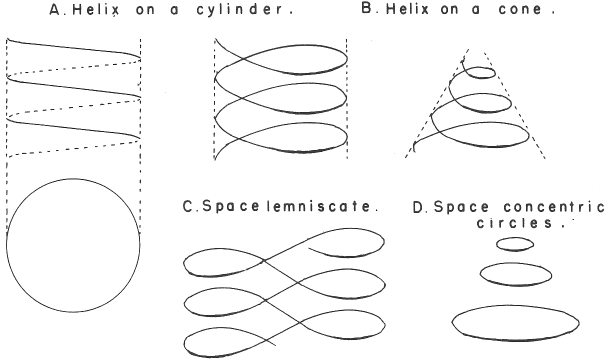 From George Gamow's 1961 book, The Atom and Its Nucleus. There is an earlier 1948 version. Thanks to Roy Alexander for the tip! Lawrencium, atomic number 103, has a mass of 262 au. Lawrencium was first observed in 1961 by A. Ghiorso, T. Sikkeland, E. Larsh and M. Latimer. 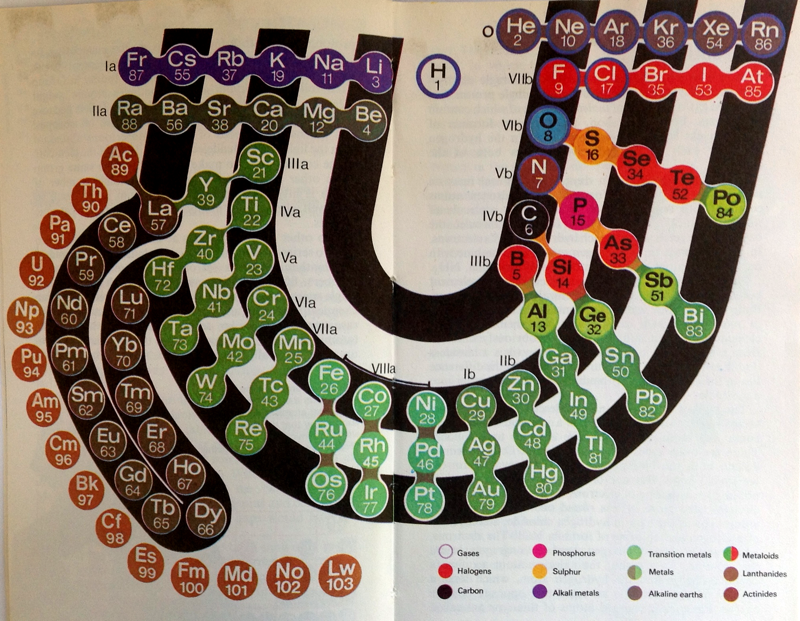 An periodic table in the Life Science Library book, Matter, by Ralph E. Lapp (1963). 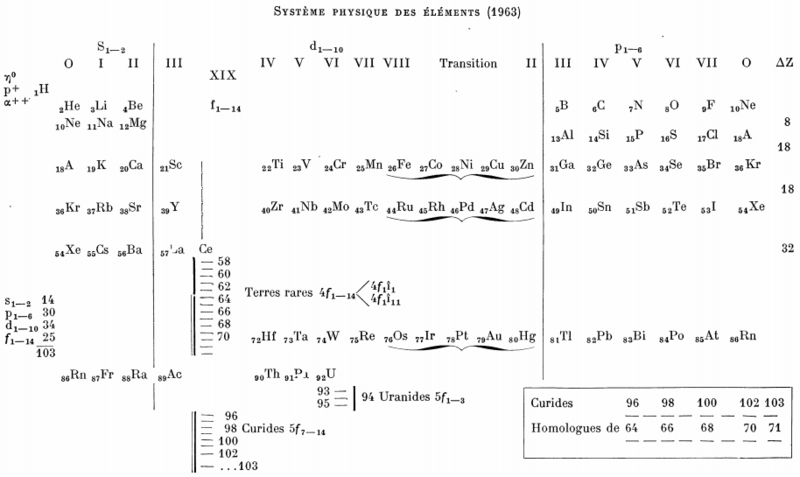 From Le Journal De Physique Et Le Radium, 24, pp27 (1963). 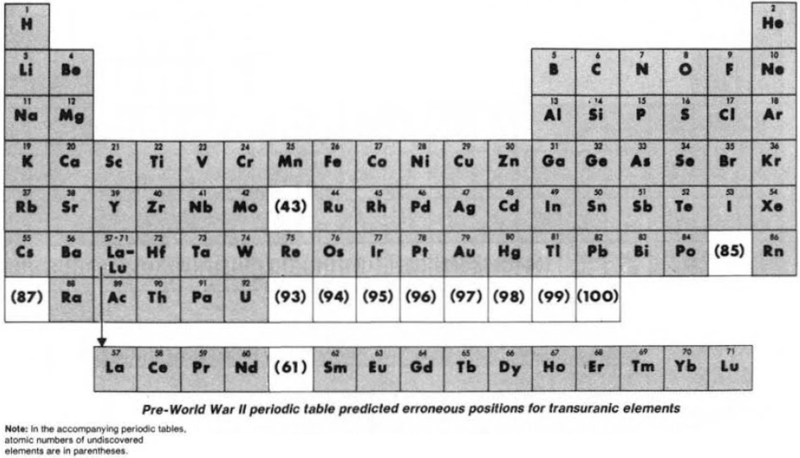 After a short historical account of the evolution of the periodic system Bedreag analyses some properties of various groups of elements: density, spectra, ionic radii, ionization potentials and so on, arguments are given in favour of the division of the transuranic elements into "uranides" and "curides". 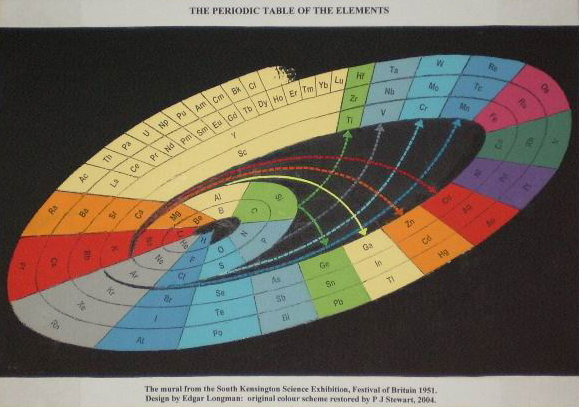 An interesting periodic table from 1964, found at an estate sale. 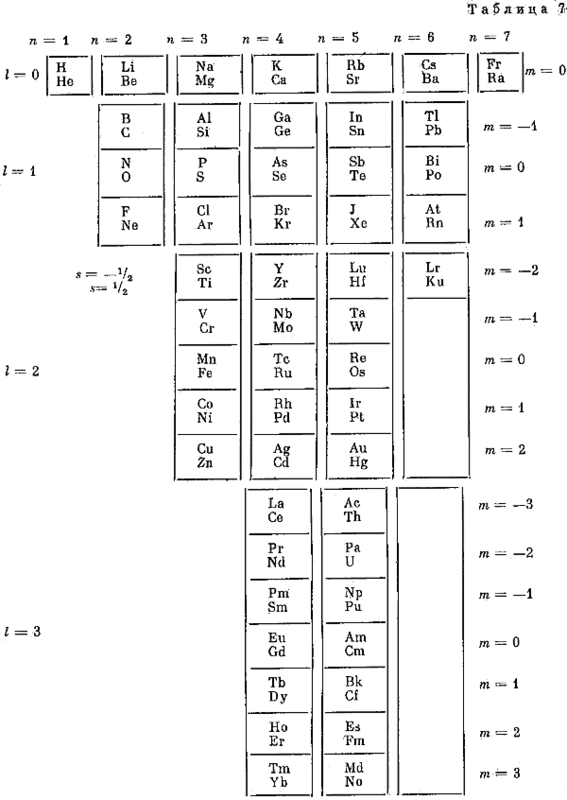 The text says that the elements are: "arranged according to the atomic number Z and column relation to the rare gases", and is by Samuel Ruben (wikipedia). Click here to see the full size version. Thanks to Rachel Helling for the tip! In his book Concise Inorganic Chemistry (pp. 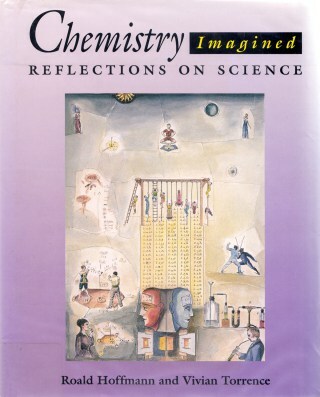 22, 5th Ed, Blackwell Science, 1996), J.D. 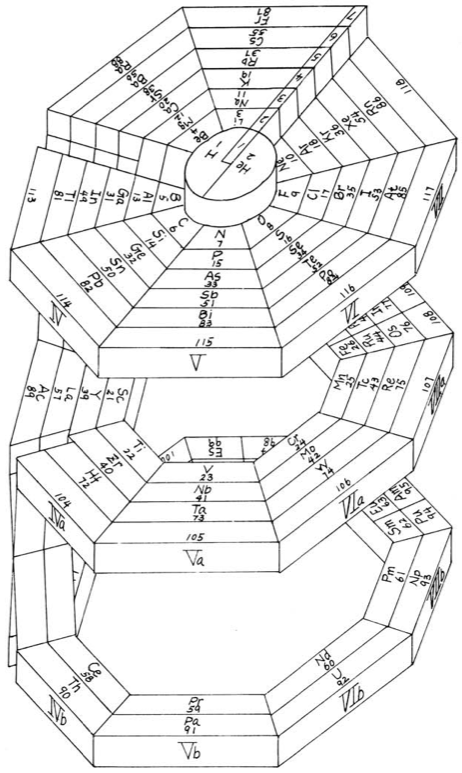 Lee gives a representation of "Quantum numbers, the permissible number of electrons & the shape of the periodic table". 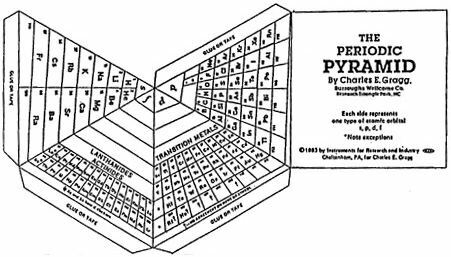 Roger Hayward created this periodic table for the book: Pauling & Hayward, p4, The Architecture of Molecules, W H Freeman and Company, San Francisco (1964). "By the end of the 1950s, Roger Hayward had retired from his professional work as an architect at the same time that his career as an illustrator was reaching its peak. Hayward signed a contract in the early 1960s that helped to solidify his position as a technical artist. The contract that Hayward signed was with W.H. Freeman & Company, a San Francisco-based publishing house that rose out of relative obscurity primarily by publishing Linus Pauling's hugely popular textbook, General Chemistry." Thanks to Rene for the tip! 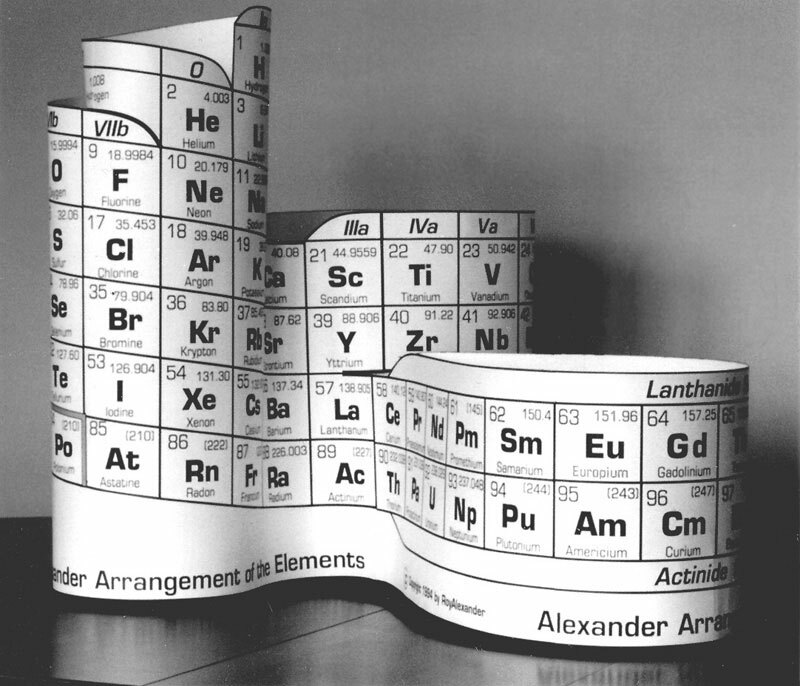 The Alexander Arrangement of Elements is a 3D periodic table concept based on strict adherence to the Periodic Law, and, like the first representation of elements in periods by de Chancourtois, connects every element data box in unbroken order. 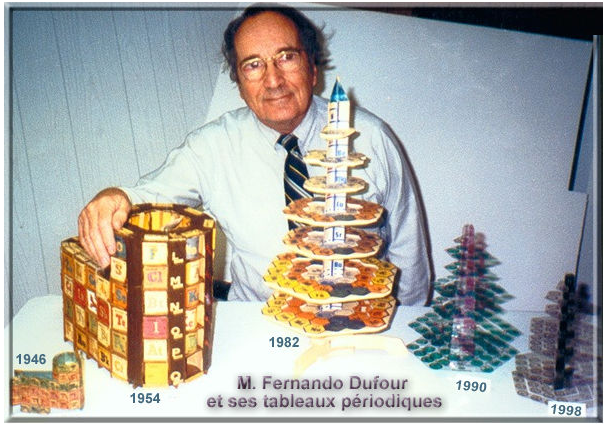 At the time Roy had no idea that others had employed a similar technique to build a 3D table - including the very first periodic table developer, de Chancourtois, who is often credited with being the original discoverer of the periodicity of elements and the originator of the three-dimensional method of element arrangement and representation. These 3D forms attempt to return the Seaborg separated f-block to its proper position in the table rather than remaining exiled. 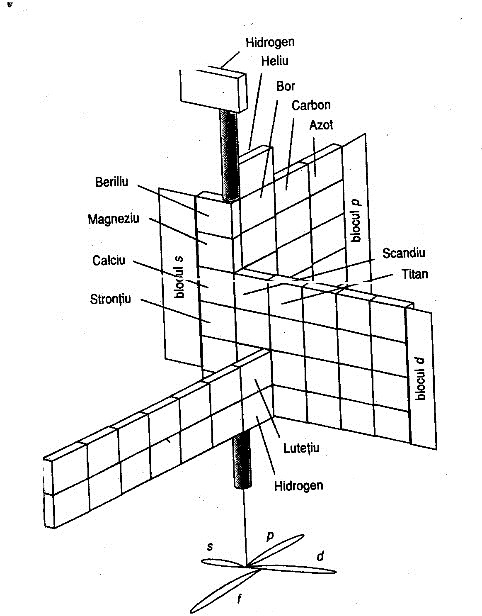 This, and contemporary attitudes about Hydrogen as being in more families than one - is uniquely addressed in Roy's 3D models. 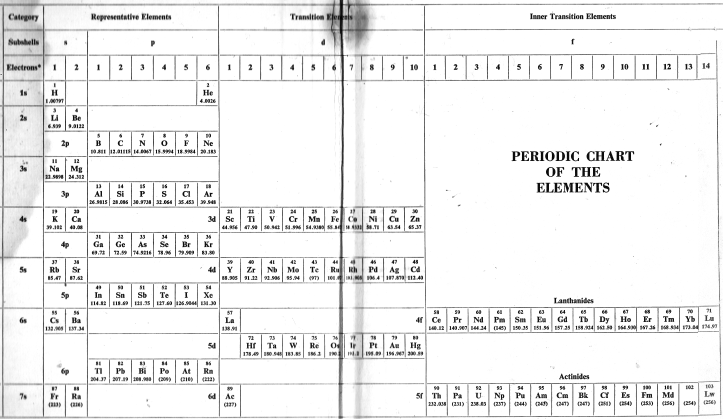 Subsequent study of the Periodic Law and the periodic table's value in education convinced Roy that the basic rationale for developing the Alexander Arrangement of Elements was only one of the many good reasons for producing it for the public to share, so he sought and was granted a U.S. patent on the p-block downslant in order to manufacture and market the AAEs as teaching/learning aids. 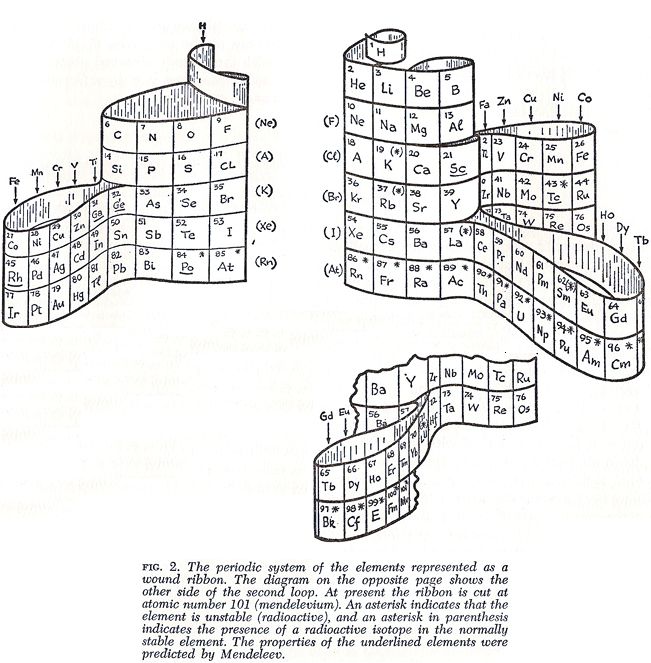 Roy Alexander's goal of introducing the AAE into classrooms, laboratories, chemistry textbooks, and reference material remains the same today, but rather than replacing the conventional charts, its niche in education is at the very point that a lesson on arrangement of atoms into a chart begins. 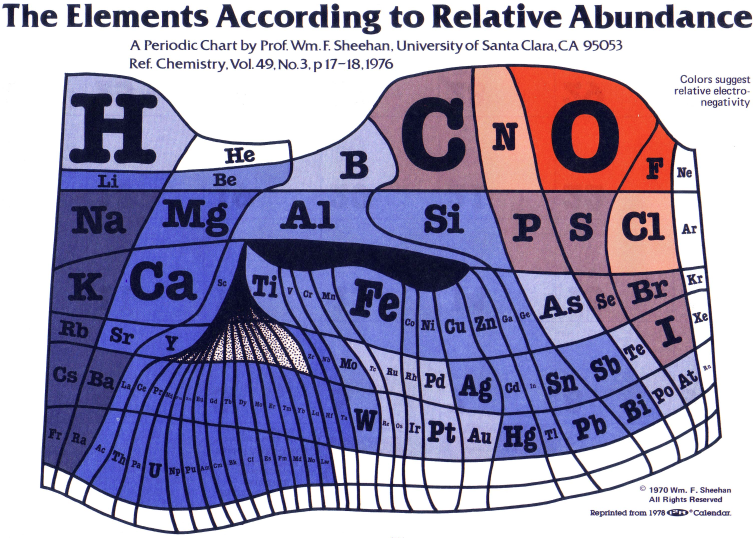 Element sequencing (vs. 24 breaks/gaps) credits the chart as well as the Periodic Law, which establishes subsequent confidence in the common flat charts, much as the world globe establishes the reality, and flat printed projections - maps - are vital (and relished) for convenience. The first commercial production of Alexander Arrangements was in 1995, when Roy pioneered by constructing a website - periodictable.com - for marketing. Three versions were printed: two versions for student entry of element symbols, the larger die-cut for easier assembly. 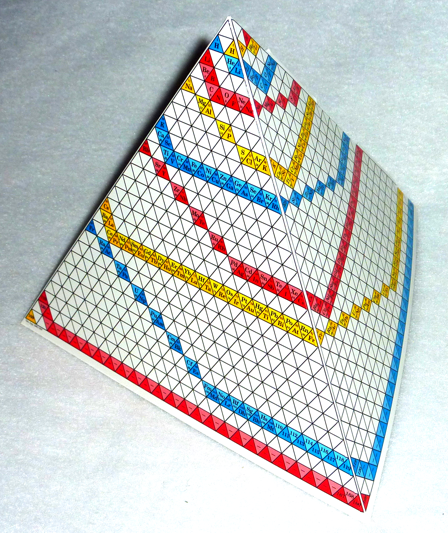 An even larger model was produced with basic element data printed in the boxes, also die cut. These were printed on white card stock, with black ink. Besides the hands-on educational application, the DeskTopper can be used as a pen & pencil caddy, and flattened without losing the continuity of the element data. 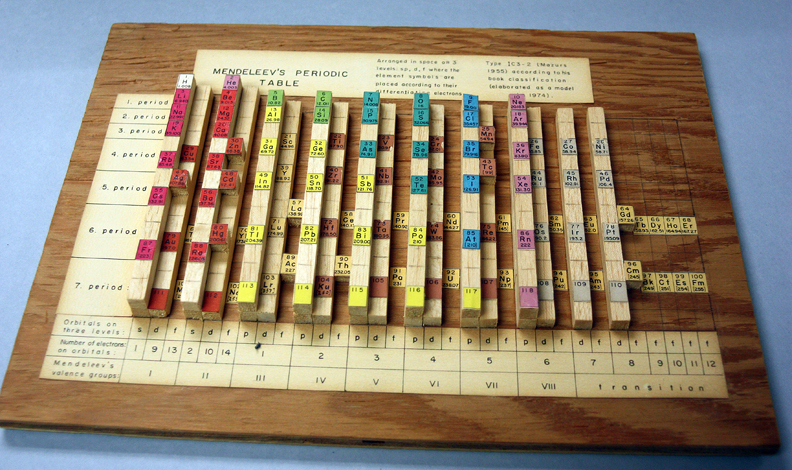 This flattened form has suggested design of a Braille periodic table of the same format, and this is also being pursued. Marketing the Alexander Arrangements was moved to AllPeriodicTables.com in cooperation with Theodore Gray in 2006, who purchased the PeriodicTable.com domain name and funded the production of Roy's newest model, illustrated with Theo's amazing element photos. 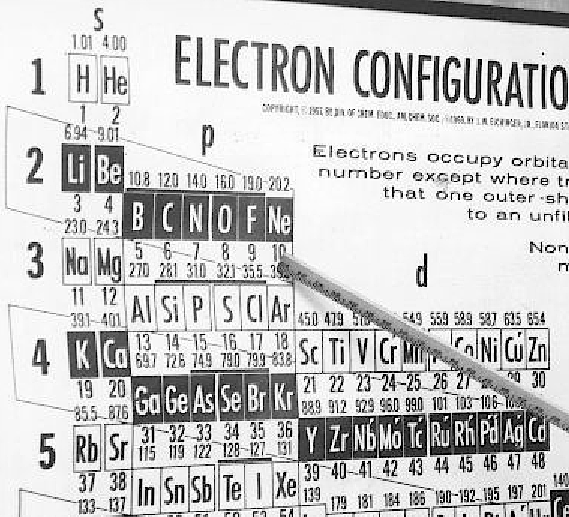 For the first time, the elements beyond those naturally occurring have been omitted from a modern periodic table, simplifying initiation to chemistry. 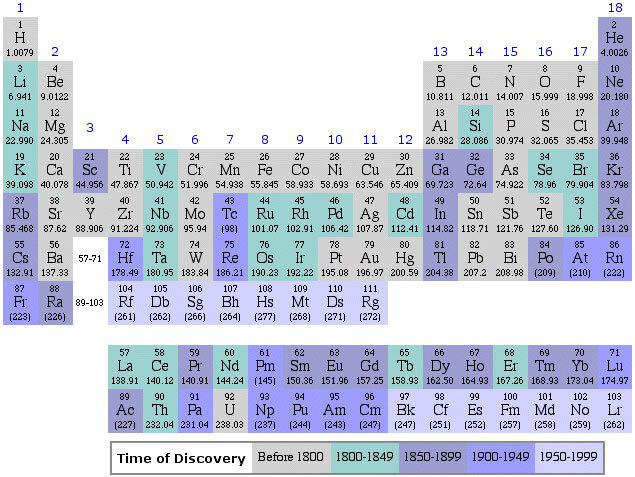 This factor denies the concept of obsolescence, and this version has been called the Forever Periodic Table. 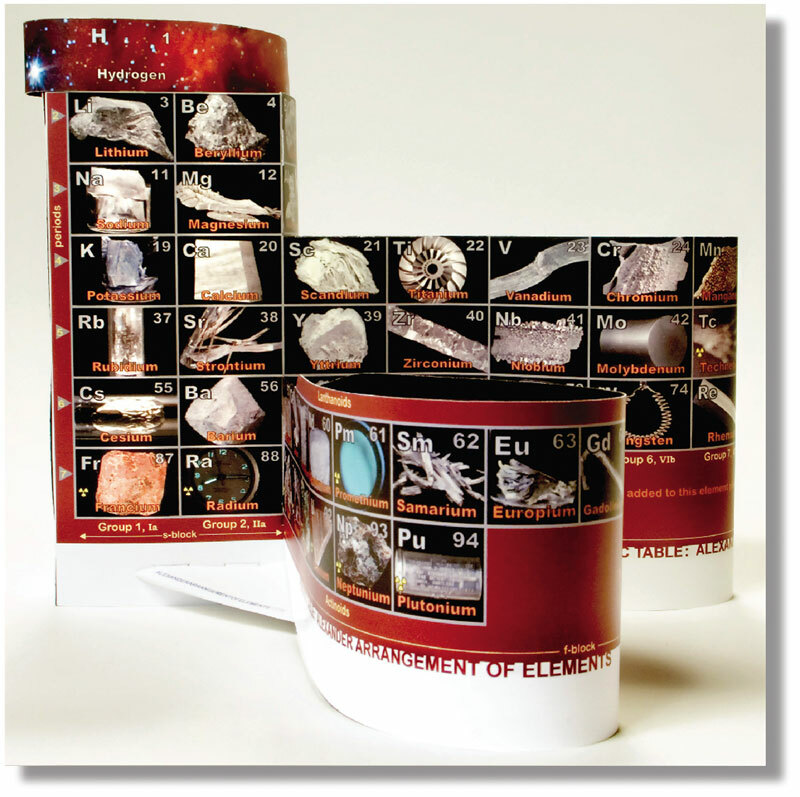 Details of this new 3D periodic table model kit have been placed at 3DPeriodicTable.com. Further AAE information and images may be found at the Alexander Arrangement website. 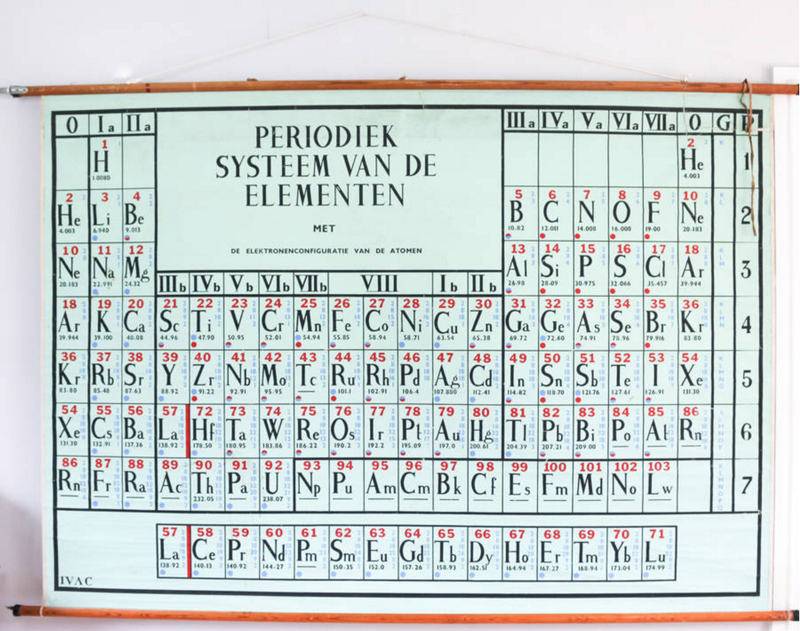 A Dutch periodic table formulation, Periodiek Systeem van de Elementen, probably from the mid-nineteen sixties: Element 103 Lr (shown as Lw), discovered 1961, is listed but Rf 104, discovered in 1964 is not shown. 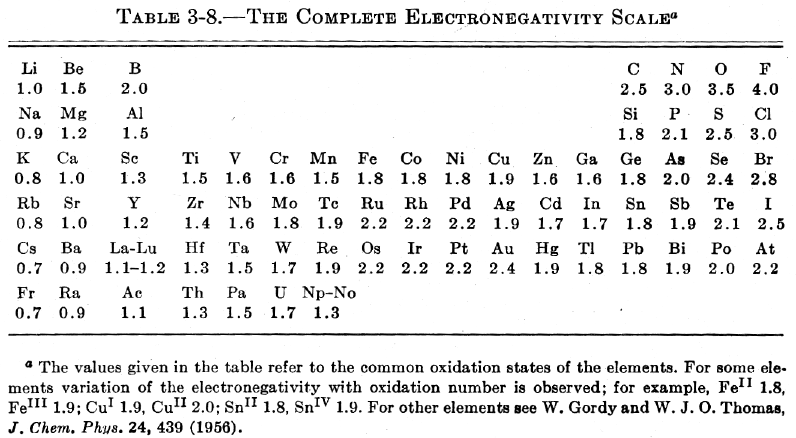 Note how this formulation shows the noble gases, He-Rn, both on the left-side and the right-side. 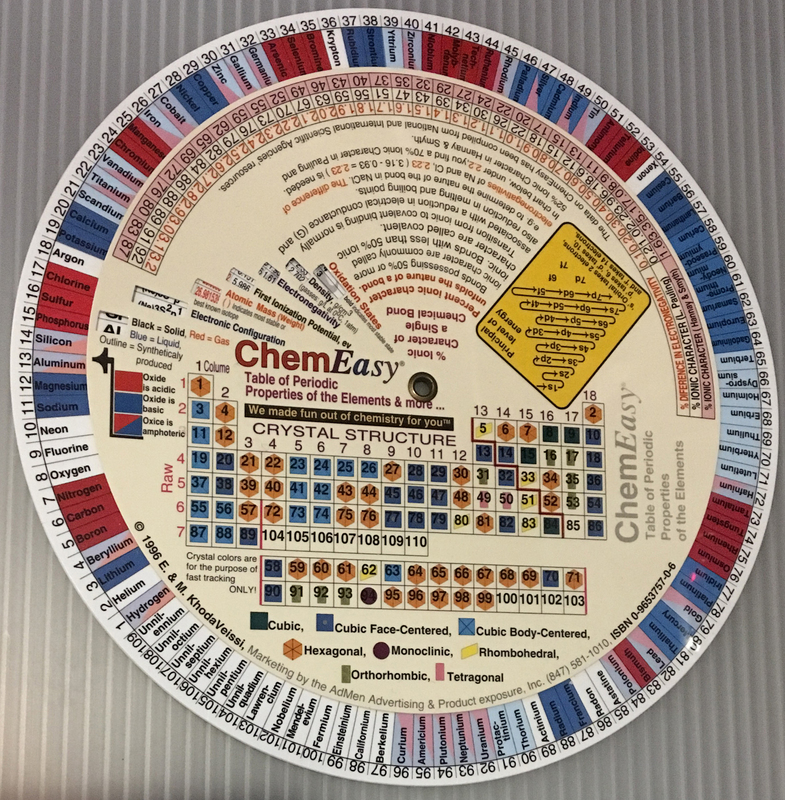 This historic and original periodic table is listed for sale (Nov. 2015) on the Not On The Hight Street website. 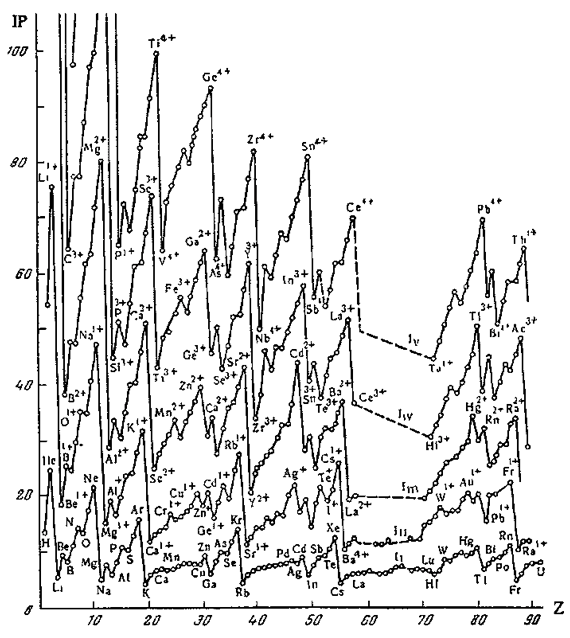 From Concept of Chemical Periodicity: from Mendeleev Table to Molecular Hyper-Periodicity Patterns E. V. Babaev and Ray Hefferlin, here. 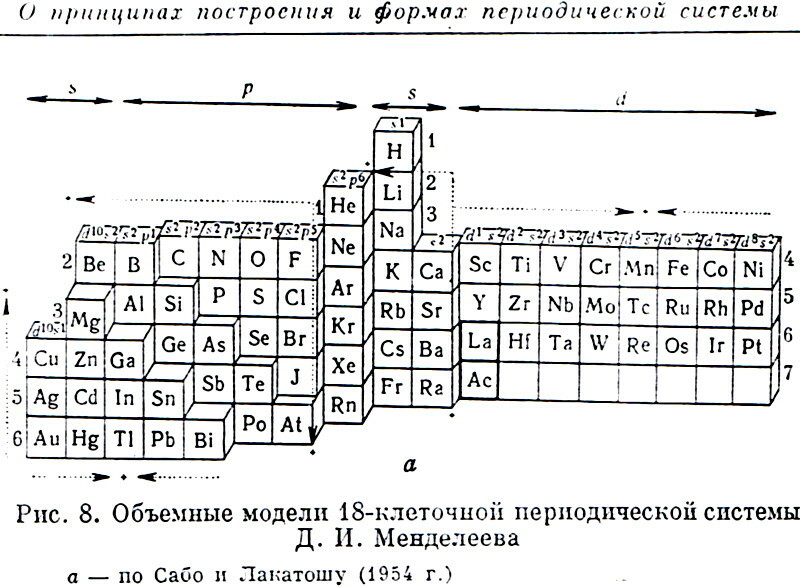 "One intriguing problem that arises from with the periodic table of atoms is the possibility of constructing periodic systems of ions, V. K. Grigorovich, Periodic Law of Mendeleev and Electronic Structure of Metals, Nauka Publ. : Moscow, 1966 (in Russian). An atom can be completely or partially ionized to a cation by removing electrons or transformed into an anion by the addition of new electrons. 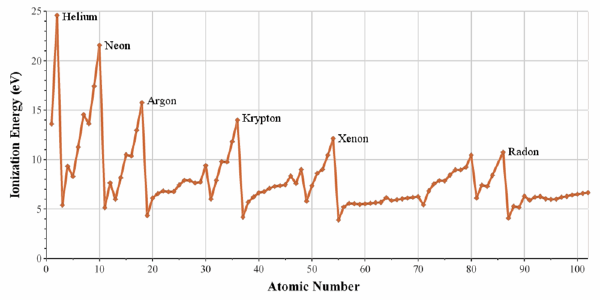 The energy required for a few consecutive ionisations of atoms is plotted against the atomic number. One can see that the curves are periodic, and hence it is possible to construct periodic tables for mono-, di-, and multi- charged cations. If we look at the dispositions of the maxima and minima of the curves and compare them with those for atoms, it becomes evident that the magic numbers of electrons for ions are the same as for neutral atoms. Therefore, the number of electrons (but not the charge of the nucleus) is responsible for the periodicity of ions." Nobelium, atomic number 102, has a mass of 259 au. Nobelium was first observed in 1966 by E. D. Donets, V. A. Shchegolev and V. A. Ermakov. 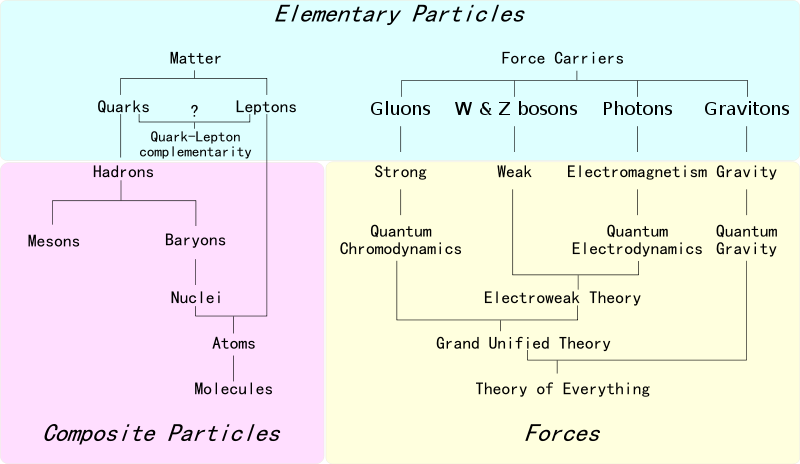 The first step towards the Standard Model of particle physics was Glashow's 1960 discovery of a way to combine the electromagnetic and weak interactions. 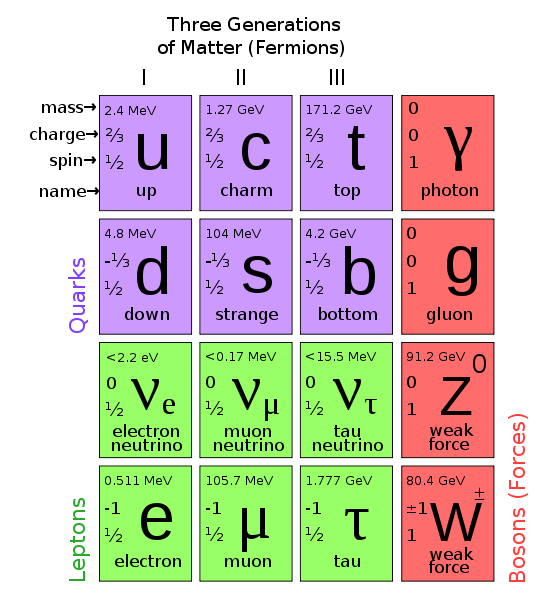 In 1967, Weinberg & Salam incorporated the Higgs mechanism, giving the standard model its modern form of: quarks leptons and bosons. 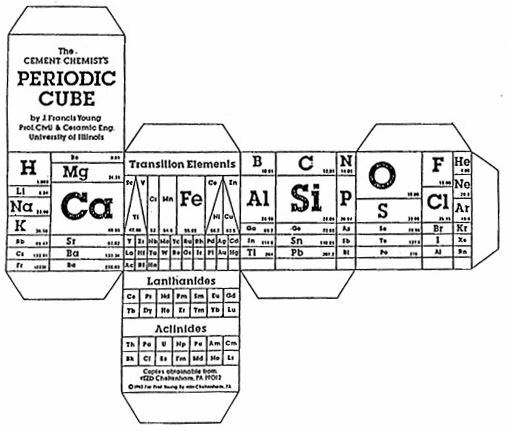 Sanderson's 1967 formulation has both the d-block elements and the f-block elements totally removed from the body of the table thus allowing the elements in the Major Groups of Periods 4, 5 and 6 to be grouped with the "typical" elements of Periods 2 and 3. 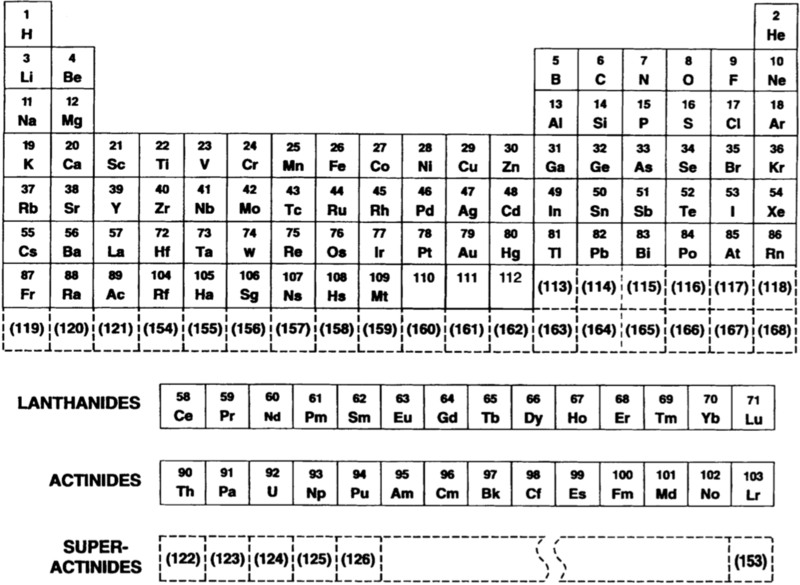 The Inner Transition elements are from Ce to Yb, i.e., in this 'rational' arrangement there are only thirteen lanthanide metals. 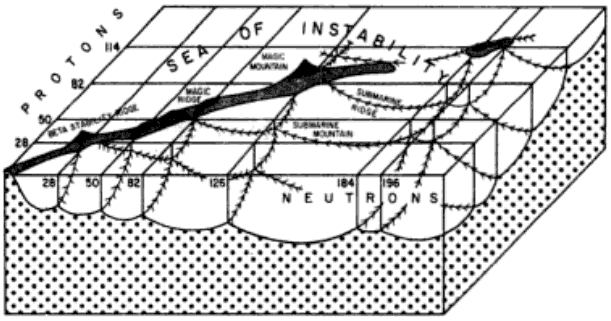 From Edward G. Mazurs' 1974 (2nd edition) Graphic Representations of the Periodic System During One Hundred Years, University of Alabama Press. 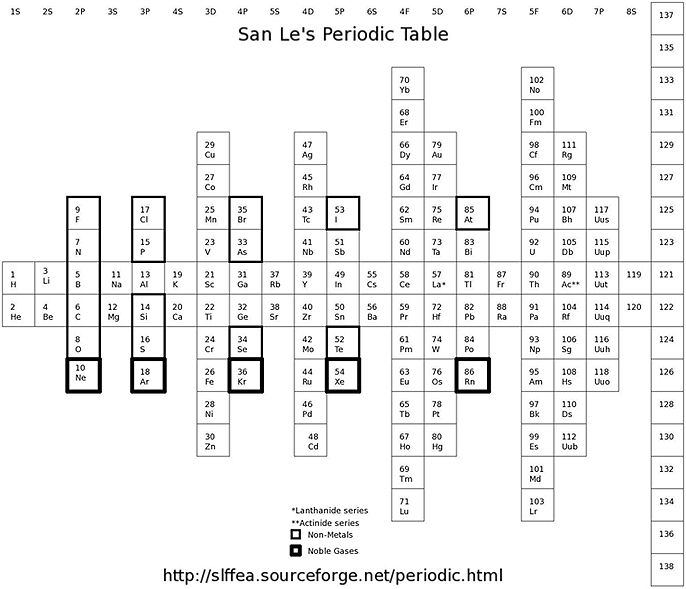 An long periodic table  developed by Glenn T. Seaborg in 1969  containing the yet-to-be-discovered g-block elements can be constructed. For the full version and discussion, go to Jeries Rihani's pages, here and here. 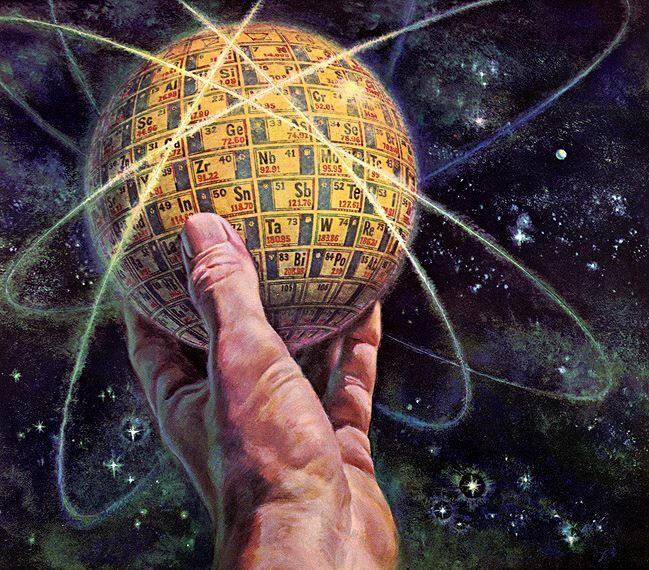 From Wikipedia: The island of stability in nuclear physics describes a set of as-yet undiscovered isotopes of transuranium elements which are theorized to be much more stable than others. 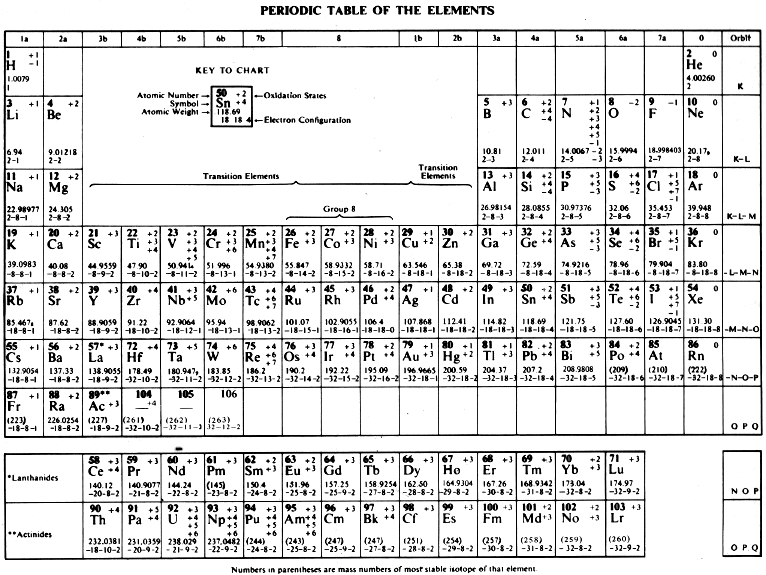 The possibility was proposed by Glenn T. Seaborg in the late 1960s: Prospectd for Further Considerable Extension of the Periodic Table, J.Chem.Educ., 46, 626-633 (1969) and reprinted in Modern Alchemy: Selected Papers of Glenn T. Seaborg (1994). The hypothesis is that the atomic nucleus is built up in "shells" in a manner similar to the structure of the much larger electron shells in atoms. 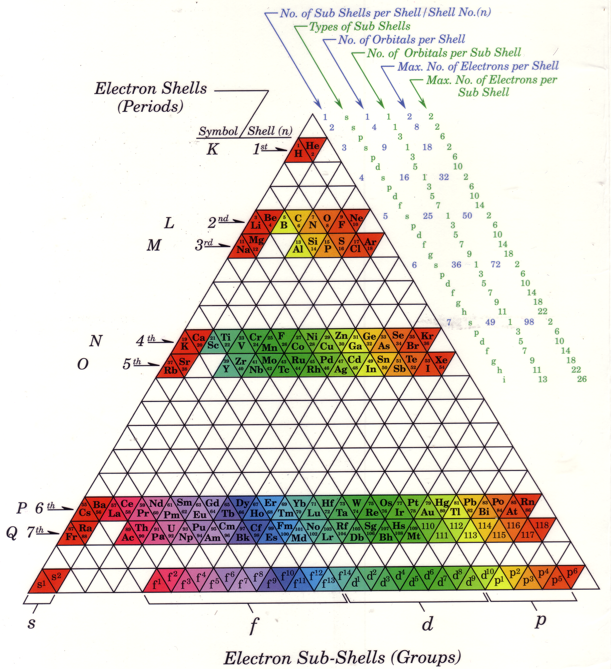 In both cases, shells are just groups of quantum energy levels that are relatively close to each other. 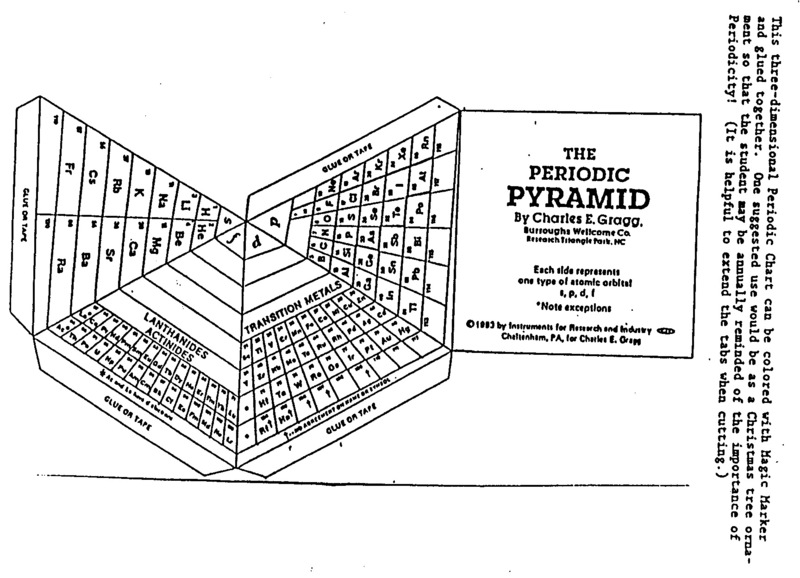 A foldout from the Mazurs book, Graphical Representations of The Periodic System During 100 Years. Mazurs said he drew it in 1967 and published it in 1969: ref. 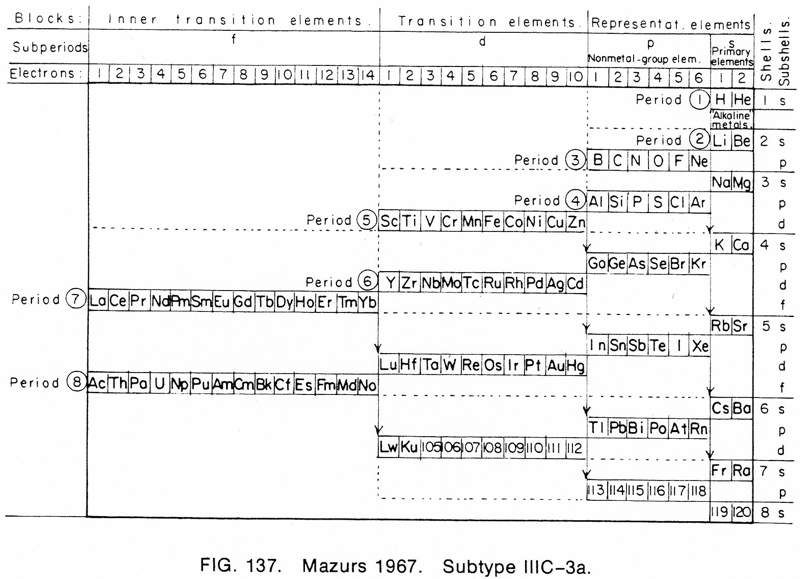 E Mazurs, A new numeration of periods in the periodic system and the Kessler Principle for the construction of the periodic table, Canad. Chem. Edu. 4(3), 21-23, 1969. Rutherfordium, atomic number 104, has a mass of 267 au. Rutherfordium was first observed in 1969 by A. Ghiorso et al. and I. Zvara et al. 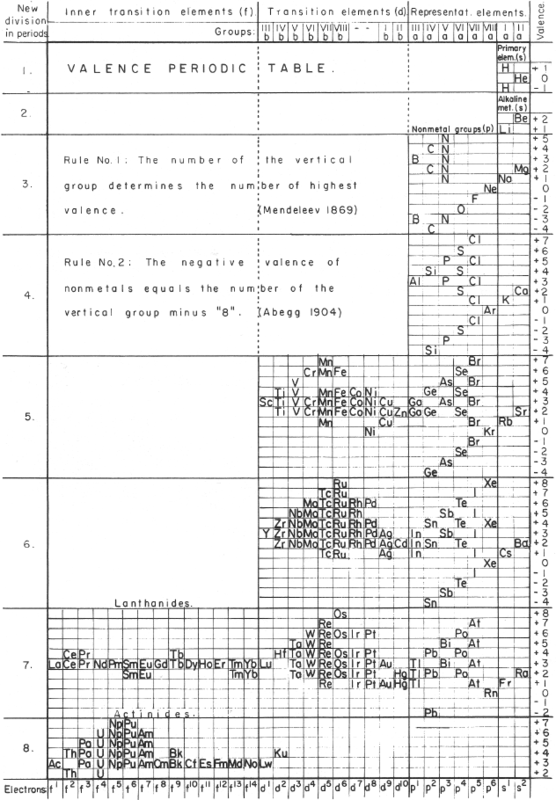 A 1970 periodic table by Prof. Wm. 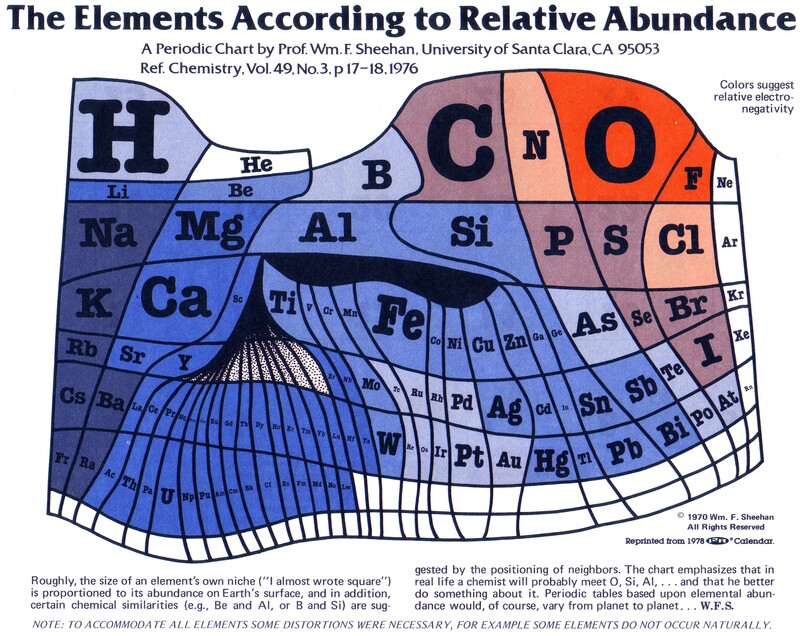 F. Sheehan of the University of Santa Clara that claims to show the elements according to relative abundance at the Earth's surface. 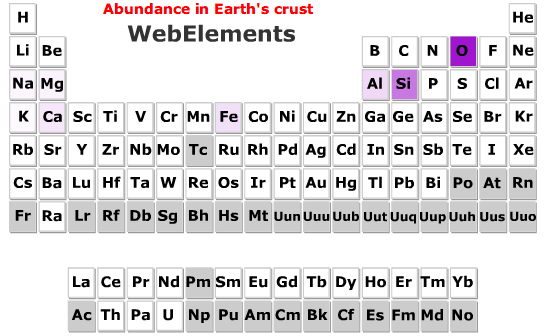 However, this author disputes the relative areas given to the various elements; there is almost no helium at the Earth's surface, for example. Dubnium, atomic number 105, has a mass of 268 au. 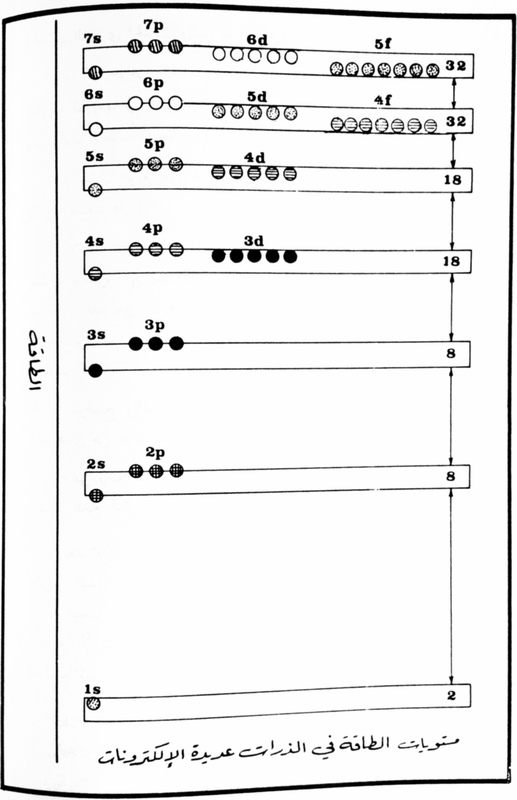 Dubnium was first observed in 1970 by A. Ghiorso et al. and V. A. Druin et al. From Linus Pauling's General Chemistry (3rd Ed.). 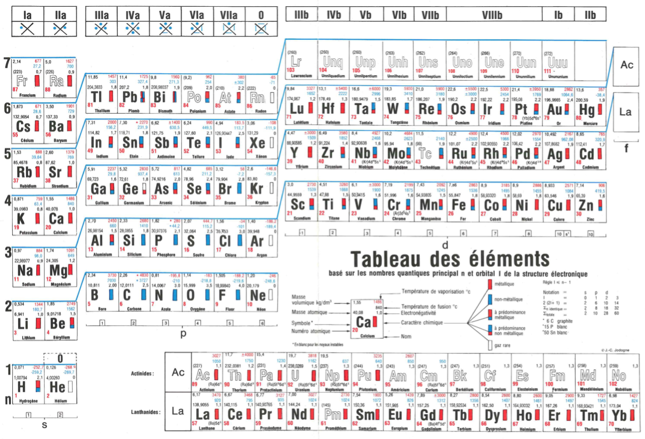 Notice that the noble gases apear twice, at the beginning and the end of each period. 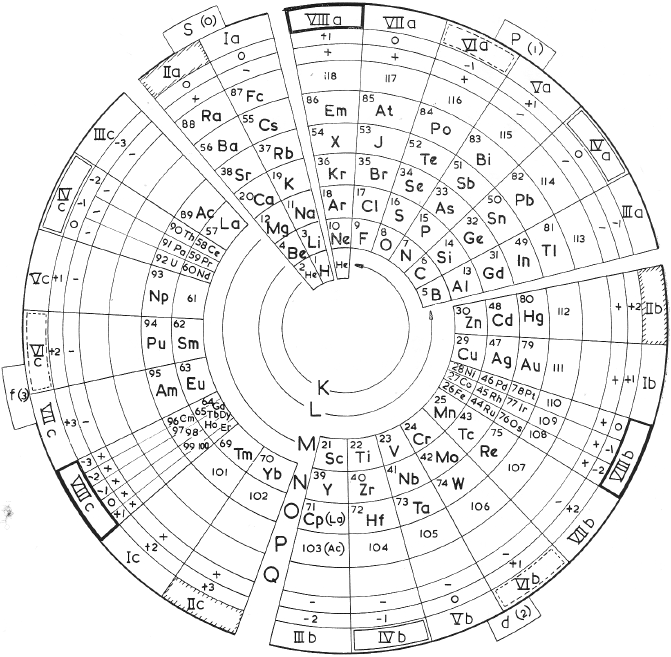 Developed in 1971 for my book The Unmysterious Universe, this periodic table is based on Dewey B. Larson's Reciprocal System of theory. 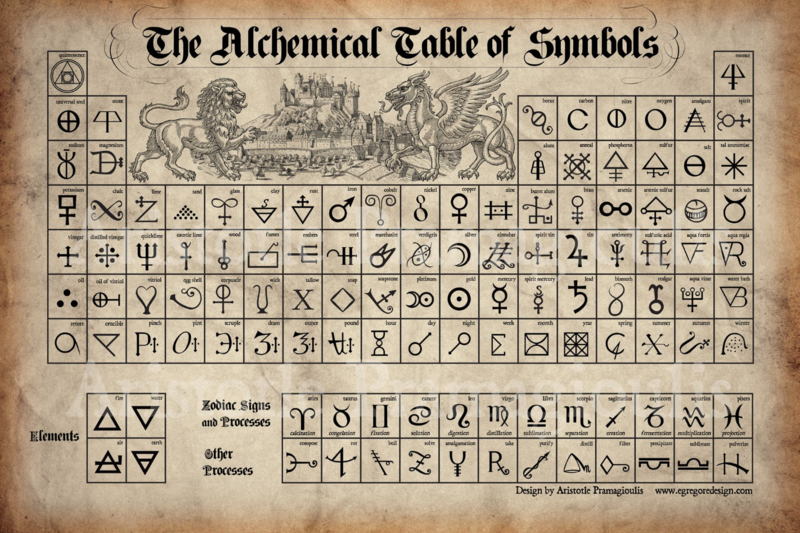 The numbers below the symbols indicate the rotational displacement (spin numbers) of the atoms. 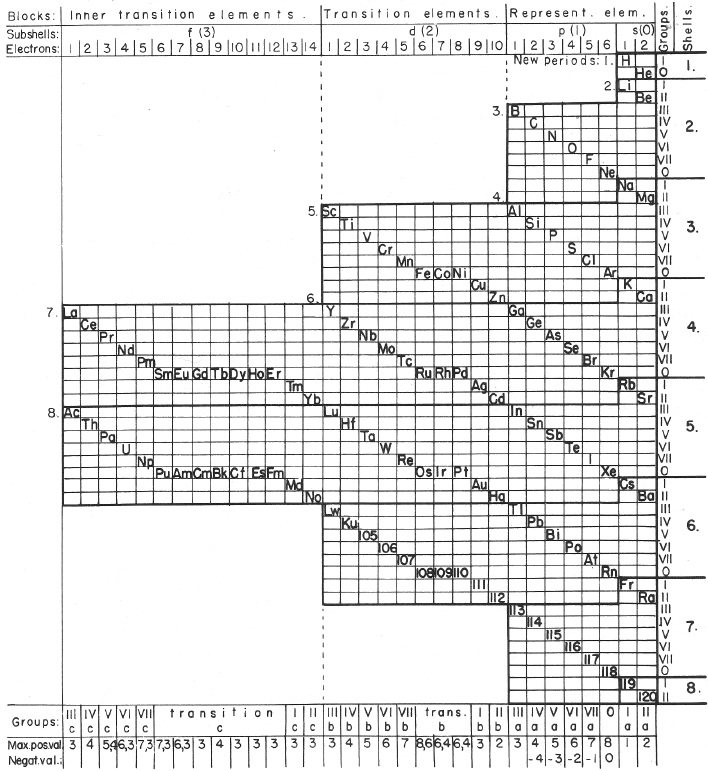 The Roman numerals indicated divisions; the rows, 1B to 4B, are referred to as "groups" rather than as "periods." 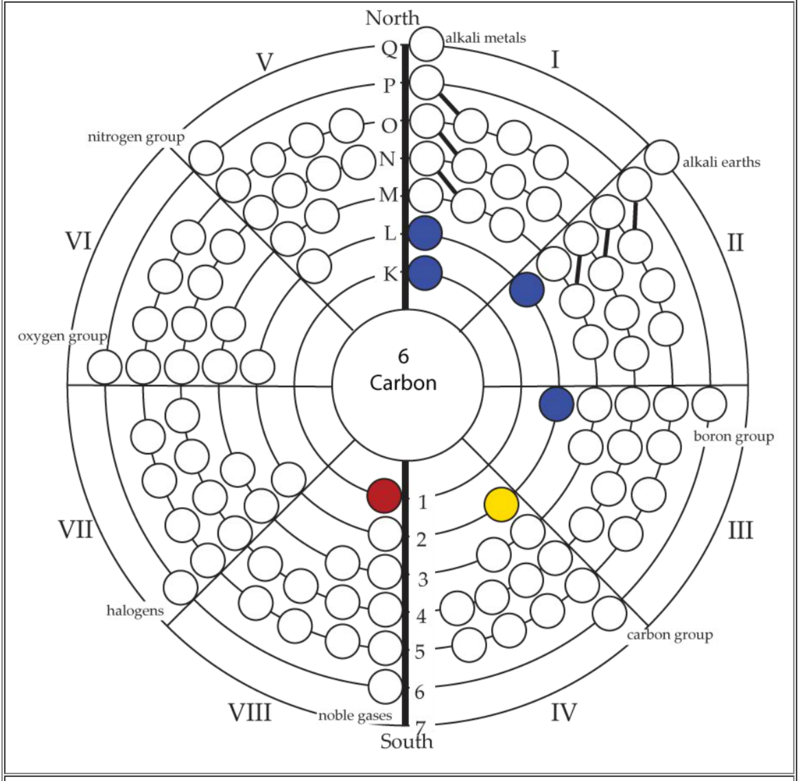 Note that we have the same trouble positioning hydrogen as does everyone else; here, I've put it over both the alkali metals and the halogens, because it acts both as electropositive (e.g., with respect to water) and electronegative (with respect to carbon). "Here's a strange table I found in the following book: Clark Jonh O.E. 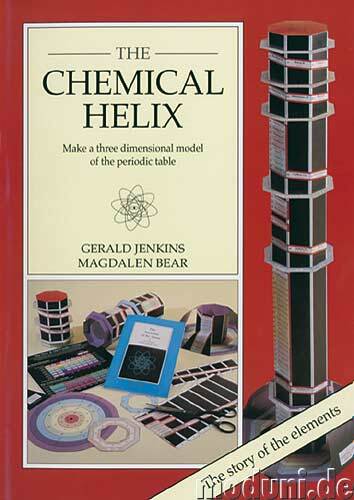 1982, Chemistry (The Hamlyn Publishing Group, Feltham, Middlesex) ISBN 0600001245. The colour coding is exasperating. The way the table is laid out is bizarre. The copy I have is a reprint of the original 1971 edition so I have to wonder if the graphic designer was drawing inspiration from the trippy 60s." "My biggest discovery this week has been a collection in our archives of the notes of Edward Mazurs, who wrote the definitive work on classifying different systems of periodic tables in 1957 with a revised edition in 1974 (Graphic Representations of the Periodic System During One Hundred Years, University of Alabama Press). 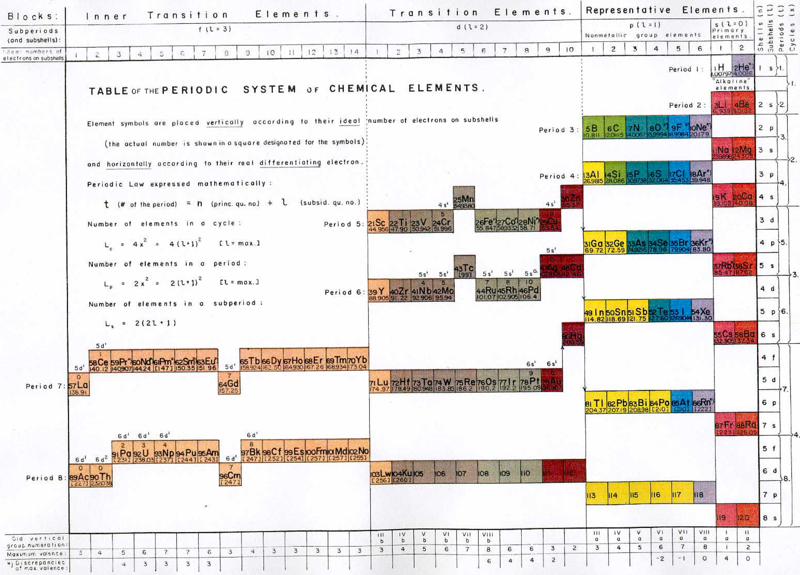 He collected articles and wrote extensive, detailed notes on every version of the periodic table he could find as it developed from its start in the early 1860s with the work of de Chancourtois through 1974. All of those notes have been donated to Chemical Heritage Foundation and fill up ten binders, with meticulous drawings, charts, tables, and frequent additions and changes. 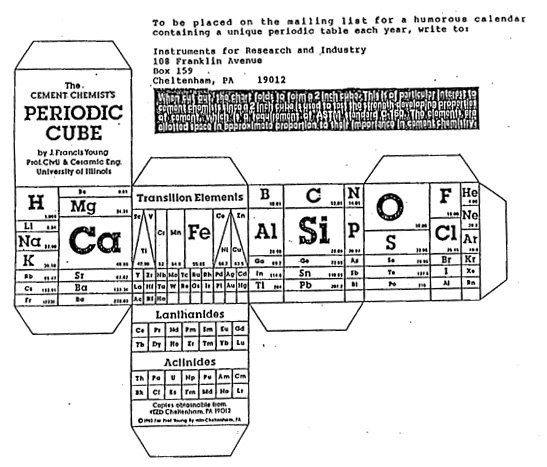 There are also some pieces of the original artwork prepared for the book, and a wooden model of the periodic table Mazurs built himself. " 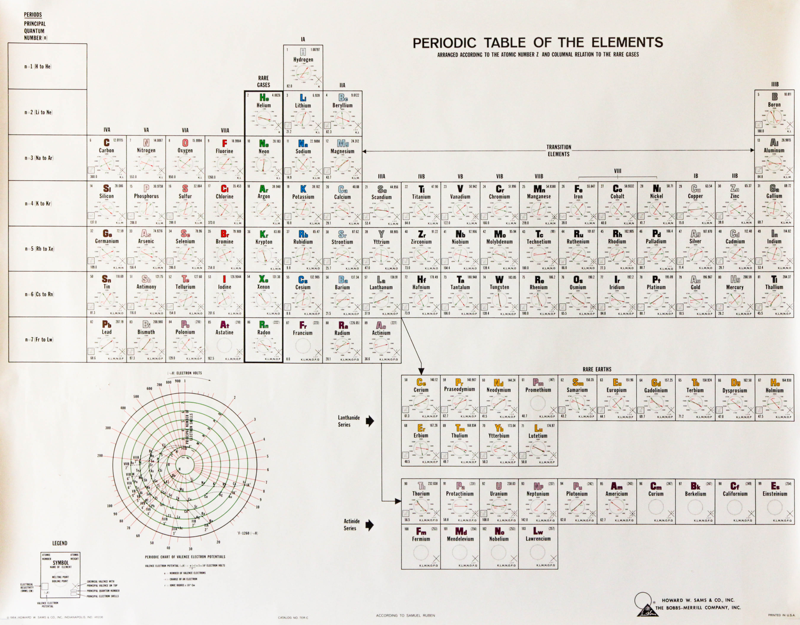 In his 1974 book Edward G. Mazurs (2nd edition) Graphic Representations of the Periodic System During One Hundred Years, University of Alabama Press gives a comprehensive analysis of periodic table formulations. Seaborgium, atomic number 106, has a mass of 271 au. 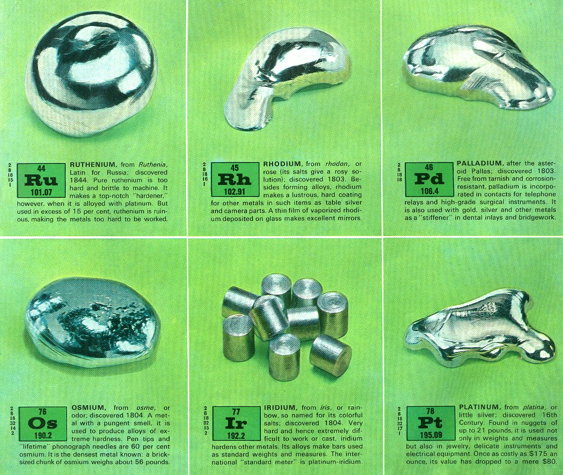 Seaborgium was first observed in 1974 by A. Ghiorso et al. 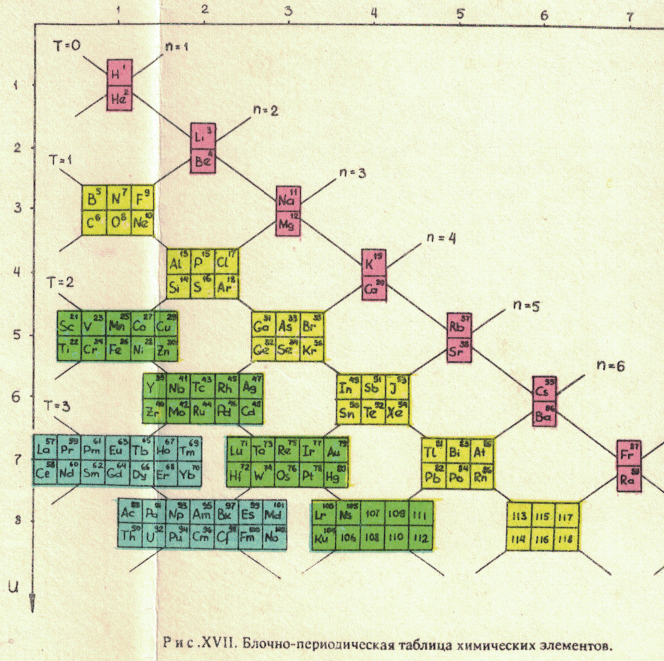 "The periodic tables [below], and data, are from some Russian books given to me by the late Ray Hefferlin, when I visited him a few years ago in Tennessee. Sorry, I can't give any source details as the inserts got separated from the book." The captions say: "Fig. XVII. 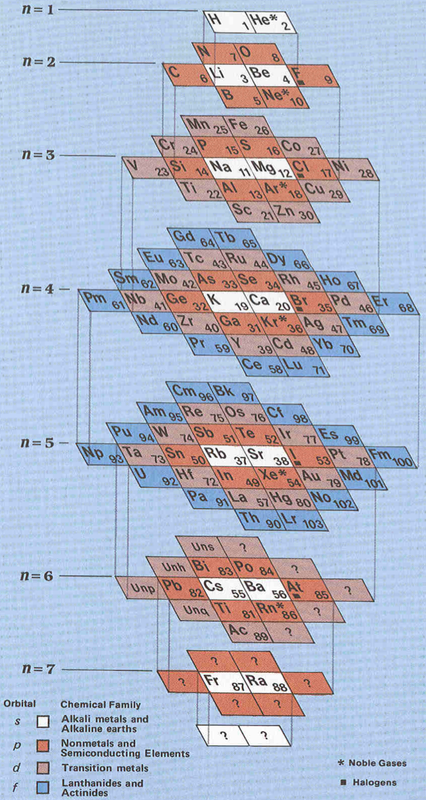 Block-type periodic table" and "U.L.Kulakov, Classification of the chemical elements on the new background". 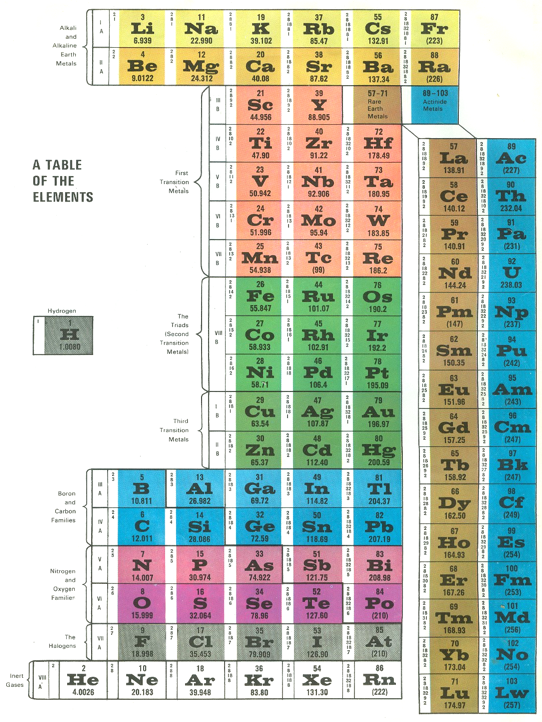 "Gelest don't seem to offer [this periodic table formulation] anymore, and because their version heavily modifies Hyde's original table, I've reproduced the 1975 version of his table with the permission of his surviving relatives." 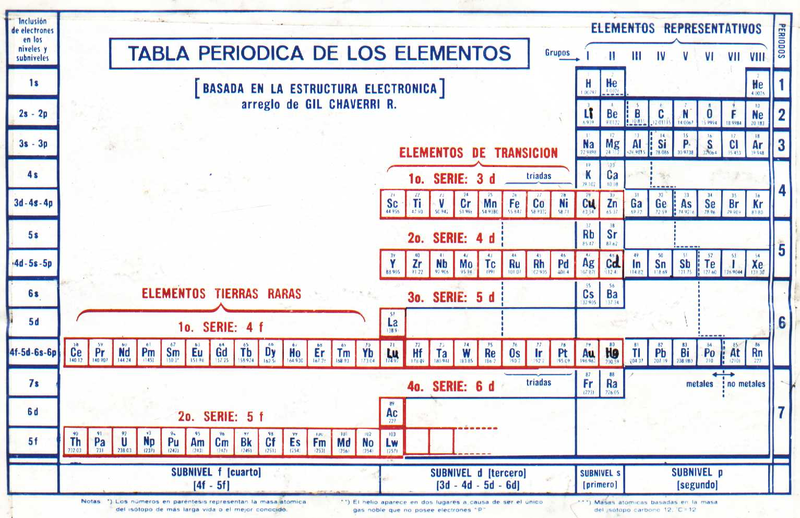 By Dr Raúl Julio Ambrosis, who taught Chemistry at the National University of La Plata in Argentina. The source is the Clasificación Periódica de los Elementos, Buenos Aires, Ediciones Marymar, 1977. 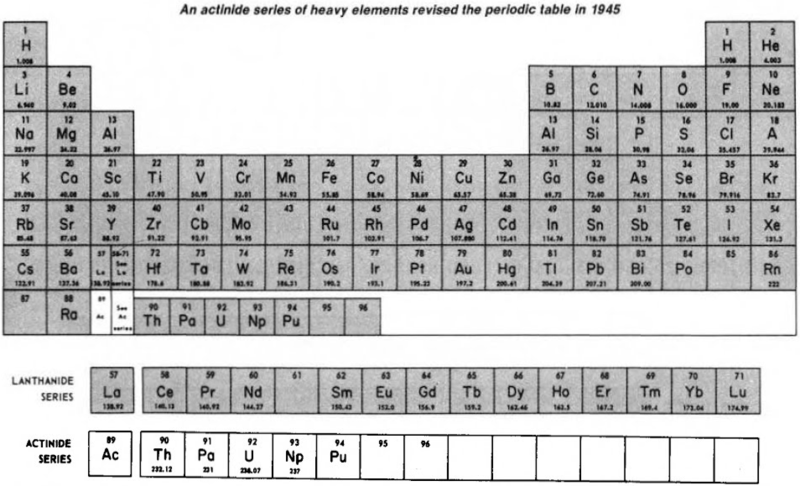 From the C&EN paper THE PERIODIC TABLE: Tortuous path to man-made elements 57, 1979, pp 46-52. 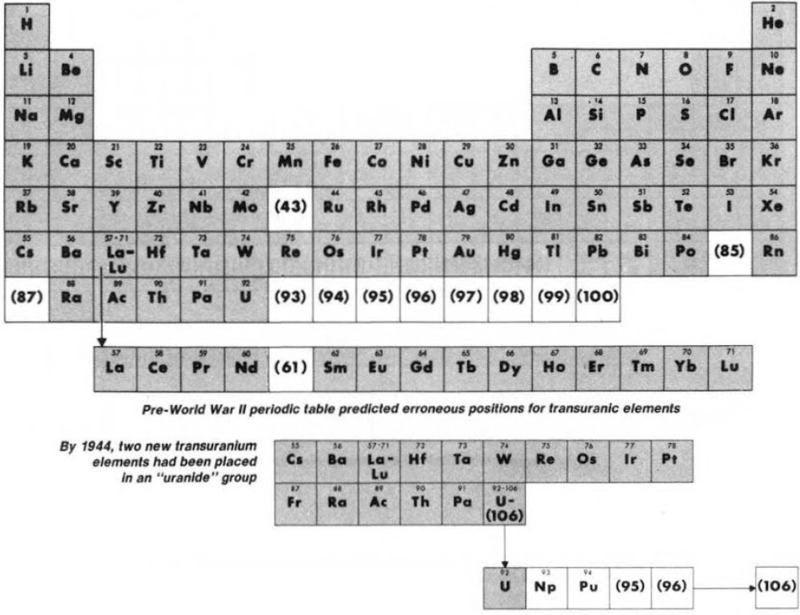 Synthesis and study of the transuranic elements – neptunium & plutonium – indicated that these new elements were "cousins" of uranium and in 1944 should be placed into a new "uranide" group. 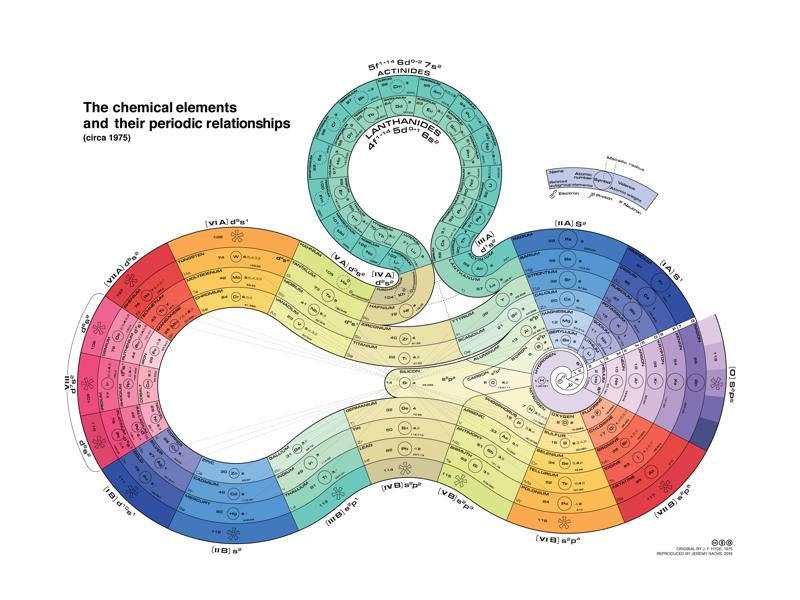 Gary Katz says: "The Periodic RoundTable is a unique three-dimensional model of the Periodic Table, an elegant spatial arrangement of the chemical elements that is both symmetrical and mathematical. 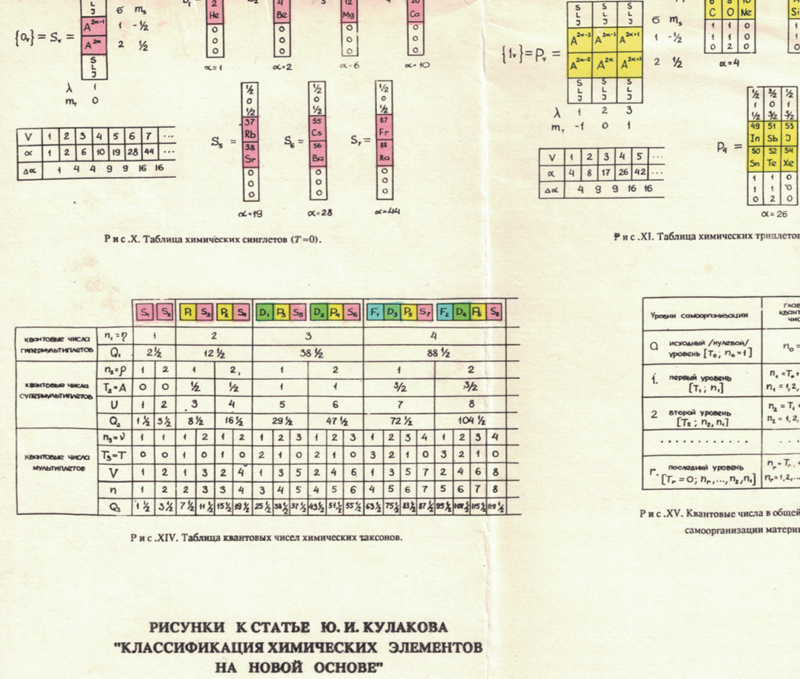 It is the ultimate refinement of Mendeleev's scheme, one that will take us into the twenty-first century and beyond. 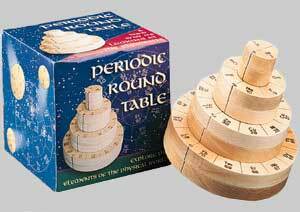 The Periodic RoundTable possesses such a high degree of order because it is based exclusively on the system of ideal electronic configuration, which in turn is the basis of periodicity among the elements. In the Periodic RoundTable the electron shells are filled in the same order as the elements themselves appear, demonstrating a holistic relationship between the chemistry of the elements and the orbital descriptions of their electrons." Bohrium, atomic number 107, has a mass of 272 au. Bohrium was first observed in 1981 by G.Münzenberget al. 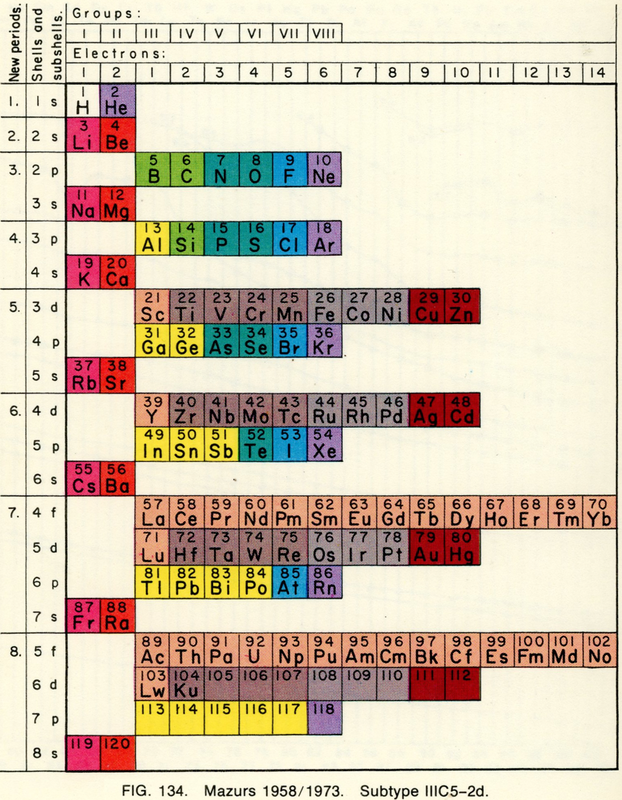 Hanno Essén's Periodiska Systems Rätta formulation of the Periodic Table, published in the International Journal of Quantum Chemistry vol. XXI pp.717-726 (1982). 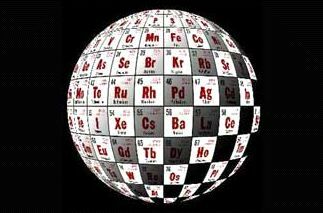 Meitnerium, atomic number 109, has a mass of 276 au. Meitnerium was first observed in 1982 by G. Münzenberg, P. Armbrusteret al. Click here for large image. 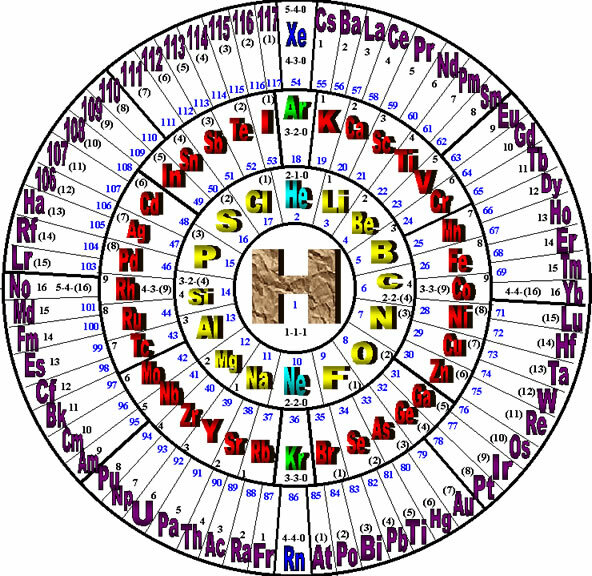 Hassium, atomic number 108, has a mass of 270 au. Hassium was first observed in 1984 by G. Münzenberg, P. Armbruster et al. 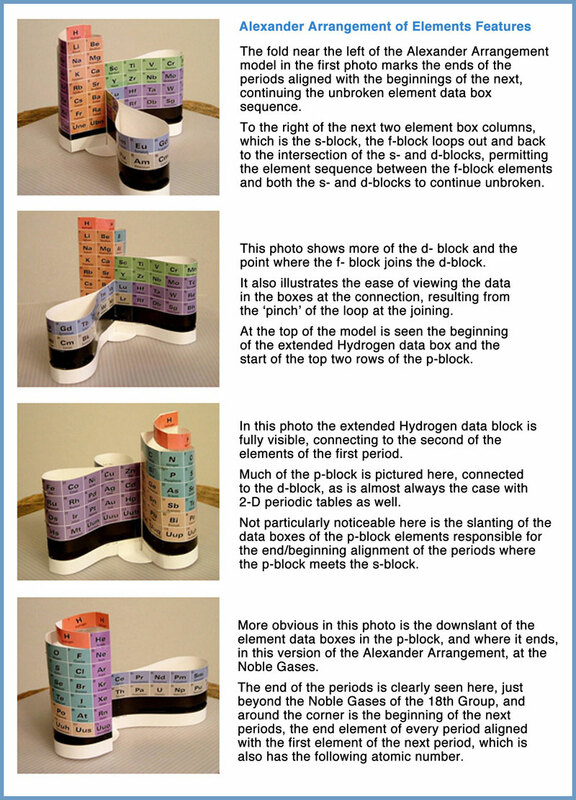 "The first image shows a periodic table similar to that of the Janet left-step periodic table, but in an upside-down flipped format.The second image displays the comparative energy levels of orbitals of atoms of many electrons." Thanks to Jeries A. Rihani for the tip! Click here for the full size version, and here for a discussion about this formulation. Eric Scerri has developed an updated version of the Stowe formulation, here. 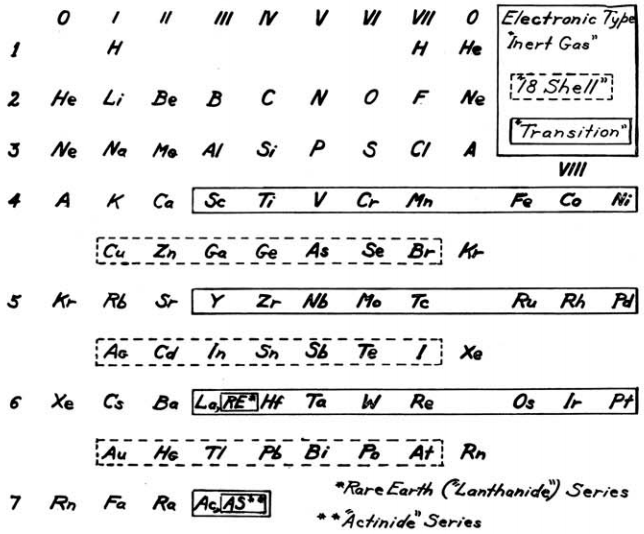 A modified form of a periodic table showing known and predicted electron shells. 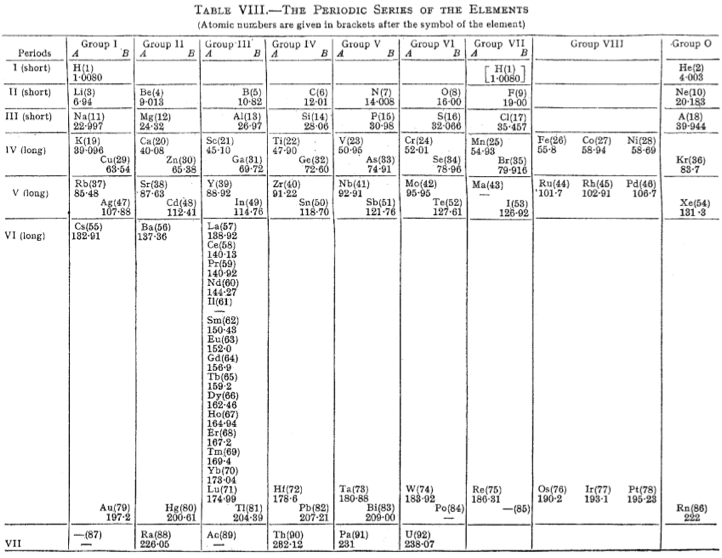 Laing's modification of the periodic table. 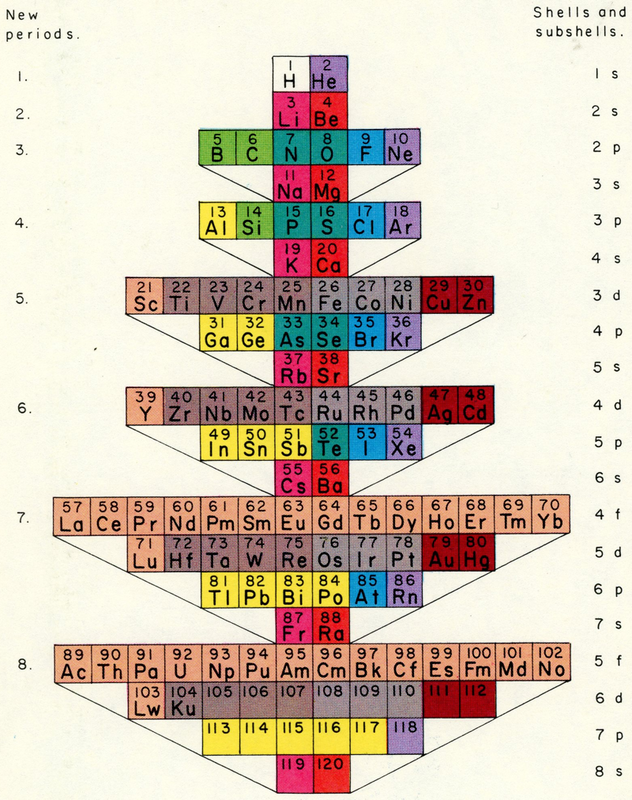 This arrangement has the lanthanide series (La to Lu) deliberately aligned with La below Y in Group 3 and with Ce below Zr in Group 4. This places Pm below Tc, thus linking their common non-existence in Nature. 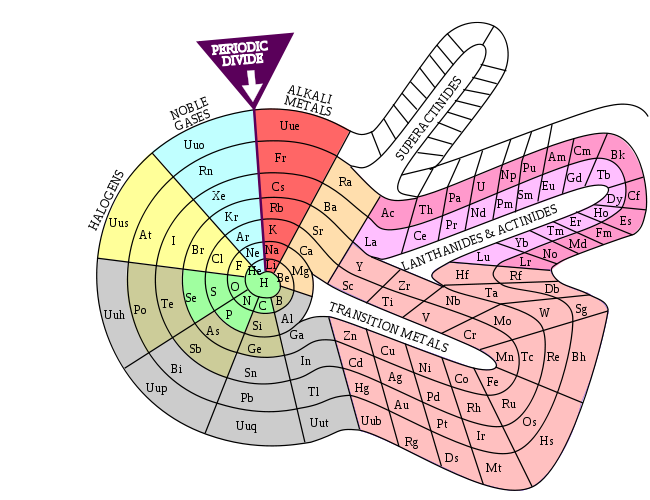 The Circular Model of the Atom is a circular periodic table that shows atomic structure in addition to periodicity. 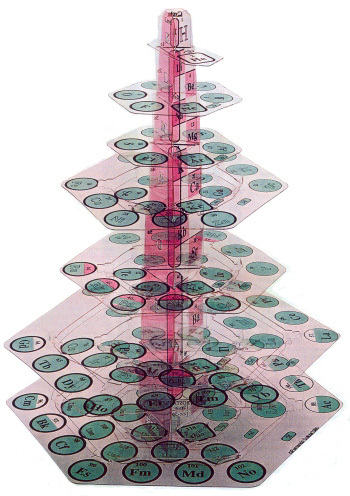 Unlike any other periodic table or model, it demonstrates that the atomic structure has an inherent dipole magnet that create positve and negative fields and elemental qualities at the atomic level. The Circular Model of the Atom was created by Helen A. Pawlowski in the 1980s, and published in her work, Visualization of the Atom. Her brother, Paul A. Williams extended many of Helen's ideas with his examination of the standard model using Helen's Circular Atom Model. This website contains some of Helen's ideas and Paul's writings. 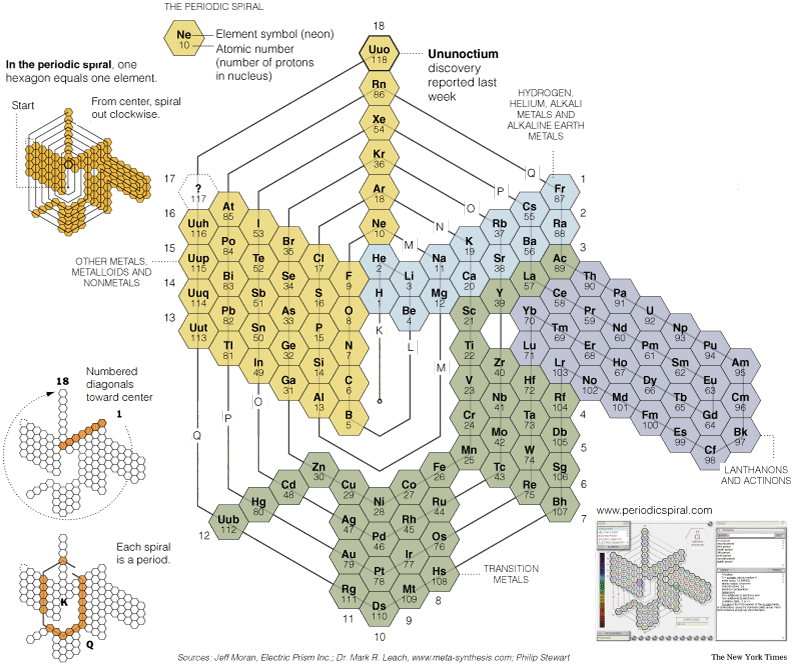 Two periodic tables by A.I. 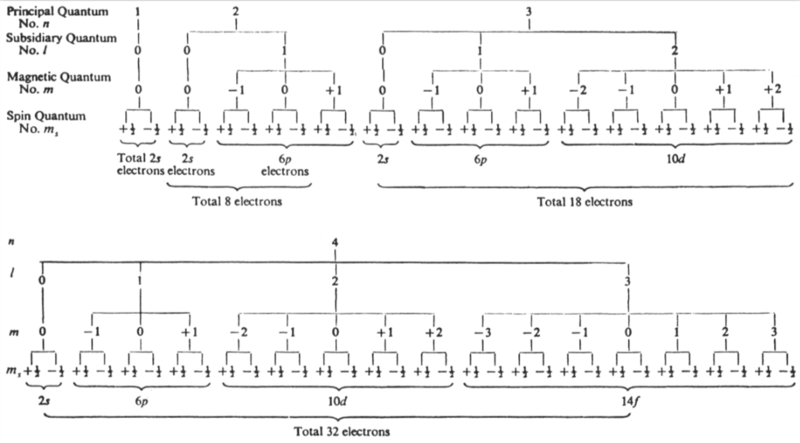 Fet from his book, "Mathematical Modeling in Biology and Chemistry. New Approach" Nauka, Sib.Dep., 1992. "First formulation, Tab. 7, is precursor of Adomah PT with broken Z-sequence and questionable pairing of elements in accordance with "ml". Tab. 8 is a Janet LST shown vertically. 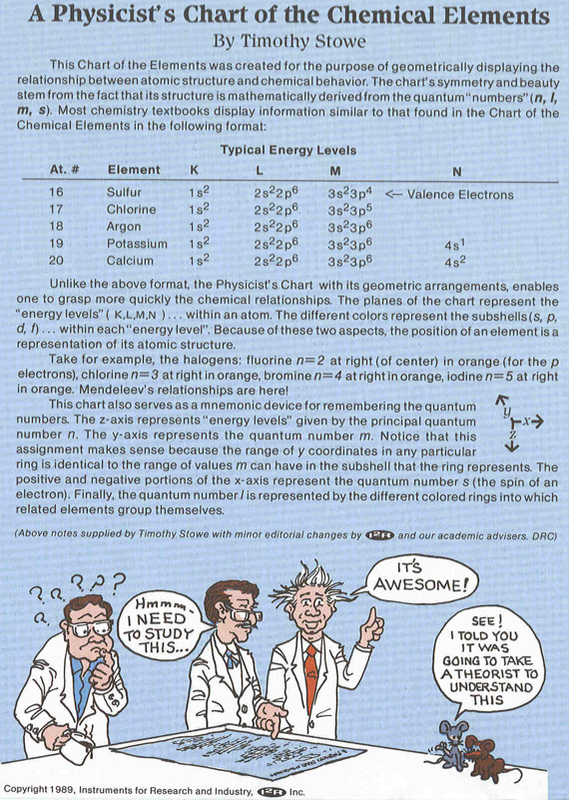 Fet discusses Periodic Table in the light of Group Theory. (The book was sent to me by Eric Scerri and it was signed by Fet for Hefferlin)." Thanks to Marcus Lynch for the tip! Darmstadtium, atomic number 110, has a mass of 281 au. Darmstadtium was first observed in 1994 by S. Hofmann et al. Roentgentium, atomic number 111, has a mass of 280 au. Roentgenium was first observed in 1994 by S. Hofmann et al. 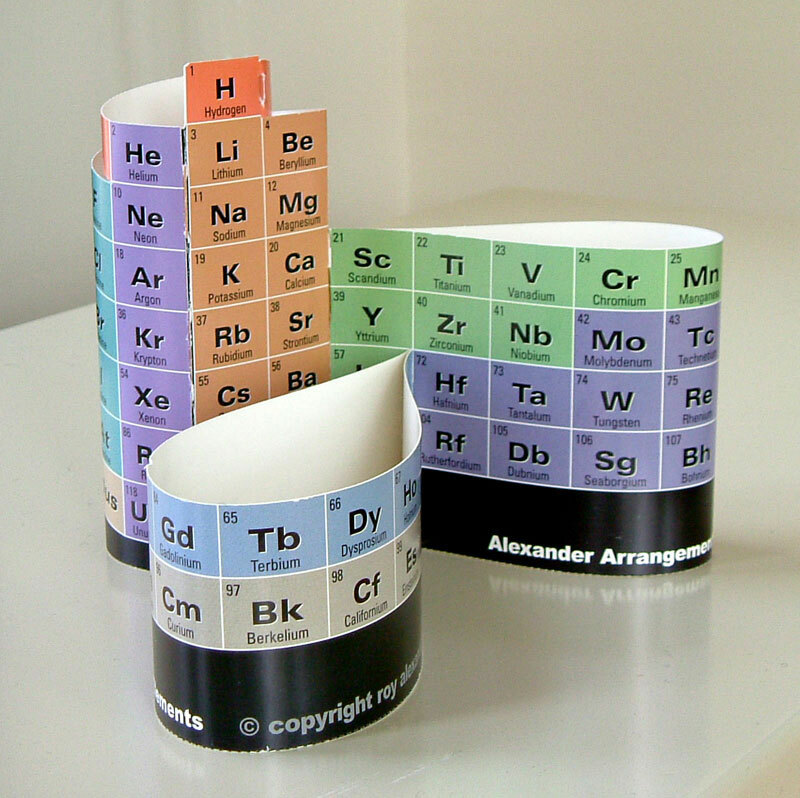 Tarquin Publications sell a make-your-own three dimensional, helical periodic table. Based on data from: Martin, W. C.; Wiese, W. L. (1996). Atomic, Molecular, & Optical Physics Handbook. American Institute of Physics. ISBN 156396242X. Copernicum, atomic number 112, has a mass of 285 au. Copernicium was first observed in 1996 by S. Hofmann et al. Thanks to Roy Alexander fo the tip! 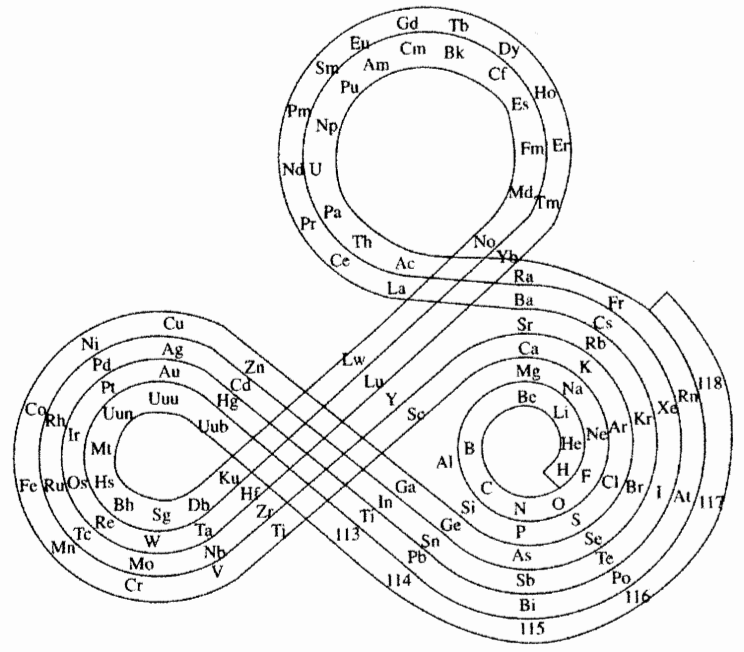 A formulation adapted by Eric Scerri from tables developed by Thomas Bayley, Jørgen Thomsen and Neils Bohr that depicts the symmetrical nature of the periodic law. 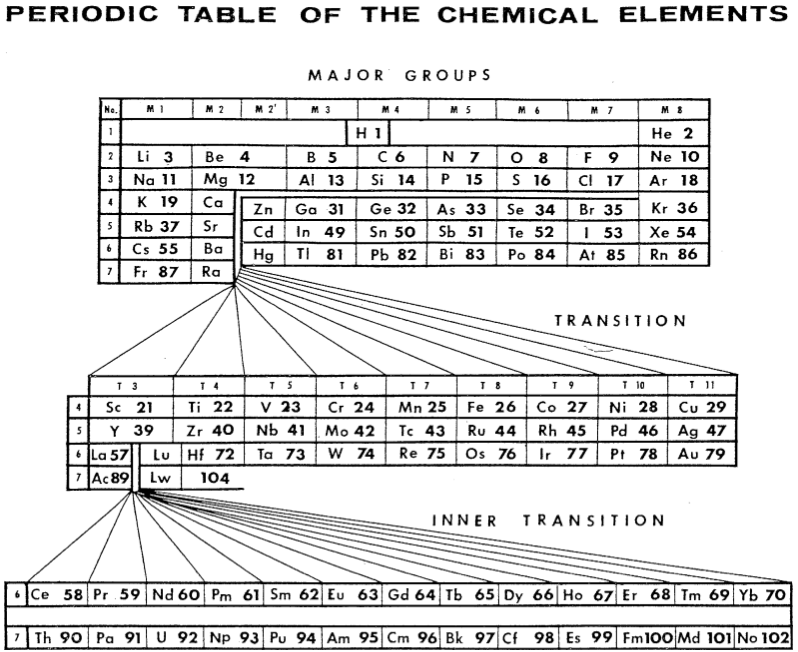 "The Geometric Organisation Of Dimension, aka 'G.O.O.D', Periodic Tables primary function acts as an identifier of relationships between like particles of matter. 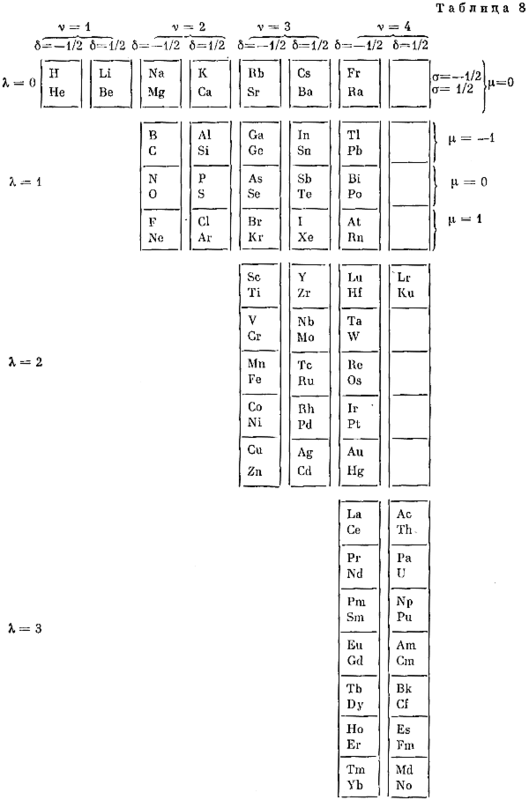 This operates utilising the original Sample process first discovered by Mendeleev; were atoms that are linked in a straight line hold a unique relationship as compared to the rest of the atoms on the table." 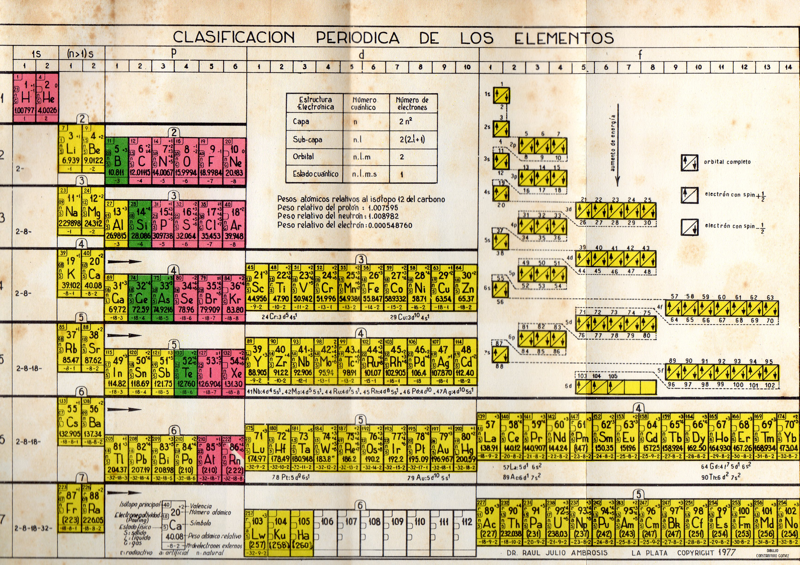 "As a curator of the Eugènia Balcells Foundation, I would like to share with you the project to celebrate the 2019 UN decreed International Year of the Periodic Table (IYPT). "Eugènia Balcells included the mural Homage to The Elements in her exhibition FREQUENCIES at the Santa Monica Art Center in Barcelona in 2009. 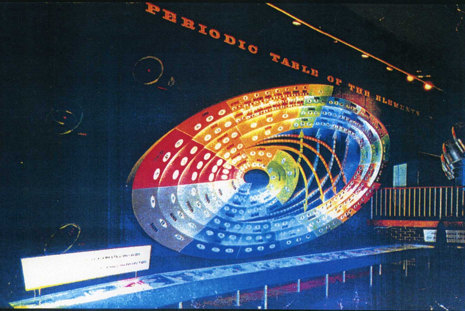 The exhibit incorporates the spectrum of light that identifies each element. 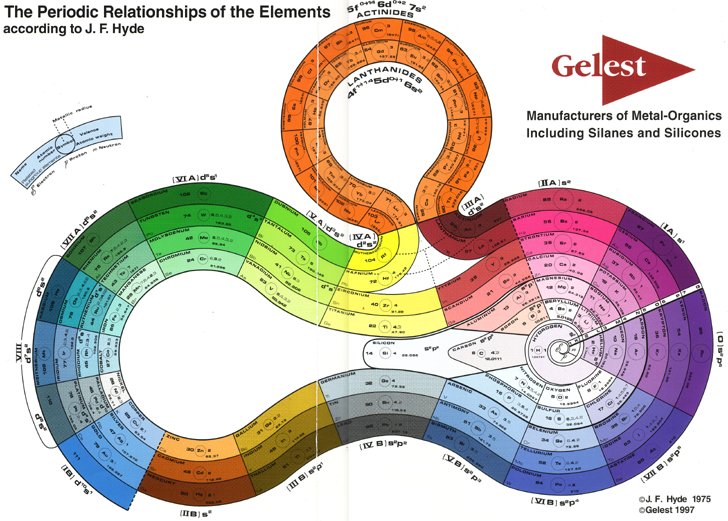 The result is not just another presentation of the periodic table, but a tribute to the set of elements that, in their intertwining, make up the material world and to those spectra that, as Eugènia Balcells like to say are: 'the voice of matter'. 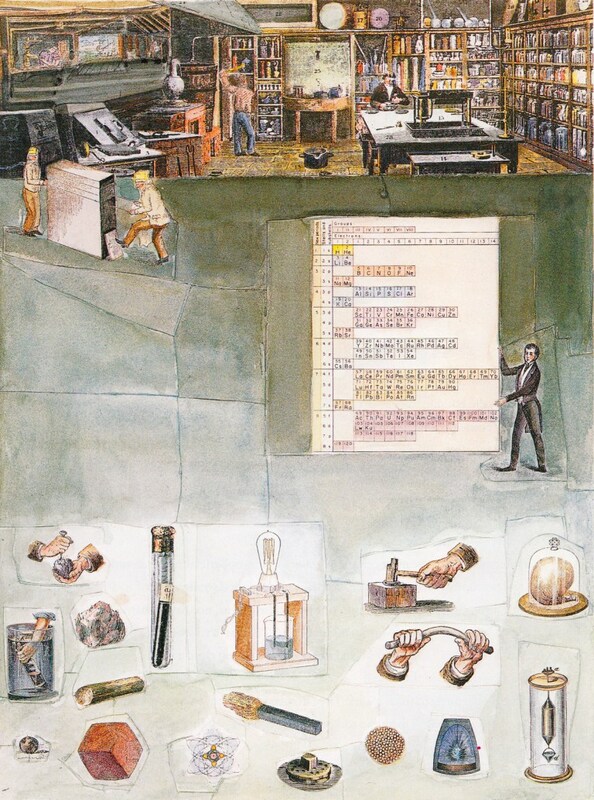 "Over the last few years, the mural Homage to The Elements has also been incorporated at the Pascual Vila Research and Development Center of the CSIC in Barcelona, at the Science Museum, CosmoCaixa, in Barcelona and we are finishing the formalities for its installation in the Universities of Tarragona and Girona. It has also been acquired by the Technische Universität Berlin, and by the Friedrich-Alexander-Universität Erlangen-Nürnberg, both in Germany. In the city of NY, where Eugènia lived for more than thirty years, the mural has found its place at the Maxine Greene High School for Imaginative Inquiry, located at the Martin Luther King Educational Campus in New York, in front of the Lincoln Center, the great ally artistic ally of the School. "The Eugènia Balcells Foundation wants to actively collaborate in the celebration proposed by the United Nations offering to the educational world the mural Homage to The Elements, this sign that represents universal unity, and records the human knowledge acquired to this day." 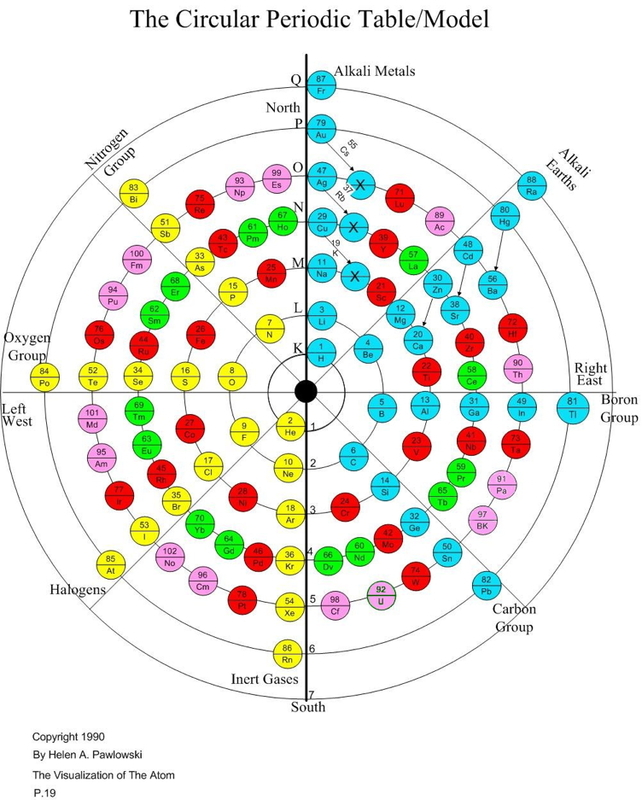 The Wheel of Motion (WoM) representation of the periodic table of elements shows the periodic nature of the elements, as developed in the Reciprocal System of Physical Theory (RST). It was originally developed by Douglas Bundy in 1998, a member of the International Society of Unified Science (ISUS). 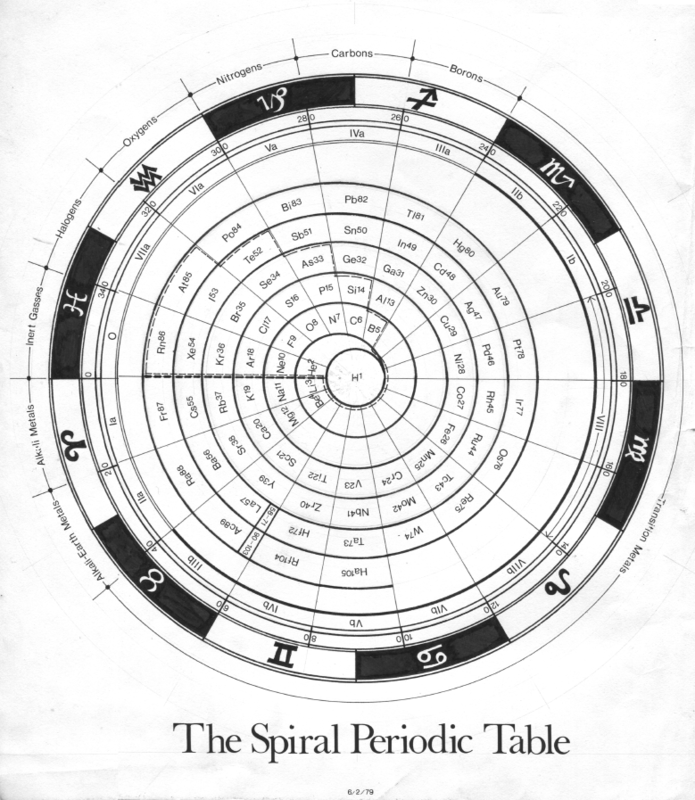 Jeoff Moran's spiral periodic table can be found at periodicspiral.com. 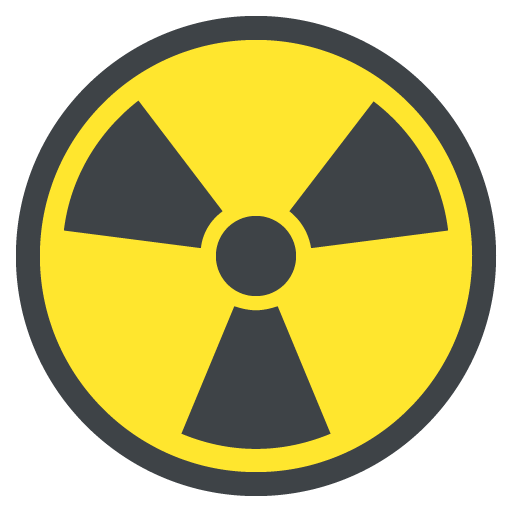 Flerovium, atomic number 114, has a mass of 289 au. Flerovium was first observed in 1999 by Y. Oganessianet et al.